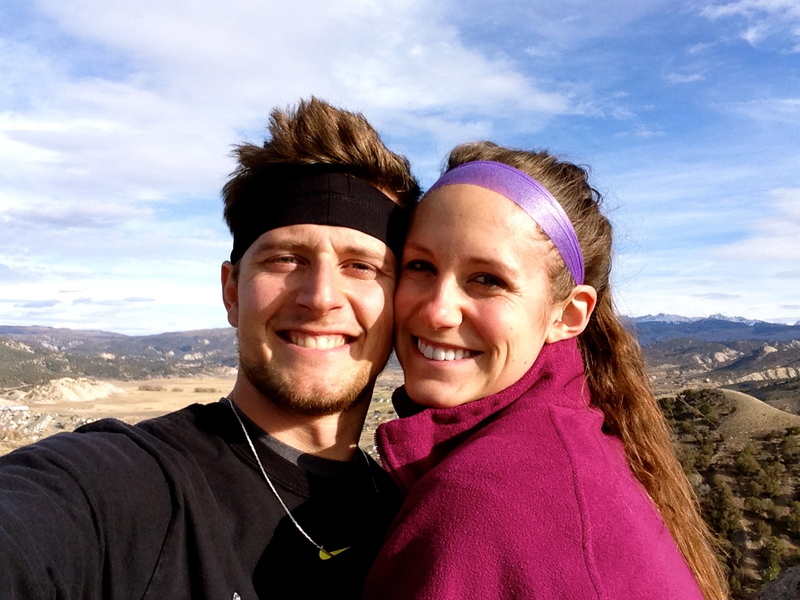 Reagan Rambler | bringing food & fitness into being a Mrs.
bringing food & fitness into being a Mrs. Whether you’ve found your way to my blog for the first time or if you’re a returning visitor…WELCOME! I’m excited to announce my site has moved to its own URL! Please visit http://www.reaganrambler.com to continue following along with me. Please note you will need to resubscribe on the sidebar to continue getting email updates. Mistakes you’re making…in the diet. Finally, part 3! If you’re just joining, be sure to check out parts 1 and 2 of this series – regarding common gym and kitchen mistakes. With the addition of this last piece, I hope all my readers will feel better educated and well on their way to making positive changes. LIES! I don’t care how many sit-ups, crunches, or planks you do…if you’re not taking care of what’s on your PLATE, you’re never going to see results! It’s not the fact that you don’t have abs, or muscles…we all do. It’s the fat over them that’s hiding any such evidence. So get your eating habits in-line by avoiding these 10 common dieting mistakes! #1. Dieting for the wrong reasons. #3. Not giving your kitchen a makeover. Out of sight, out of mind. The best thing you can do for yourself is clean out the temptations hiding in your fridge, pantry, and other nooks and crannies. Why have things around that are going to do nothing but keep you from your goals? You can do it. I promise. Just be sure to replace the food with better things. Because an EMPTY pantry and fridge sure isn’t the way to go, either! #4. Failing to plan and think ahead. We’ve all been in these shoes. You’re stuck out somewhere and it’s past mealtime. You’re STARVING. McDonalds is the only thing available. McNuggets it is. 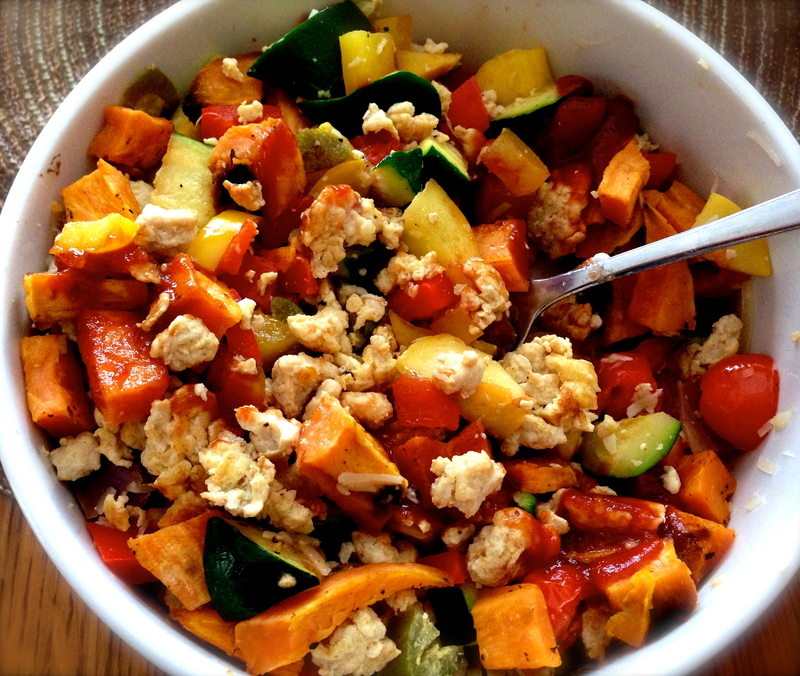 Planning your meals for the day/week ahead of time is a habit you want to form ASAP! We’re most likely to make bad decisions when we are without a plan. When you’re hungry you’re going to grab the nearest restaurant or nearest bowl of food no matter if it’s Doritos or celery sticks. 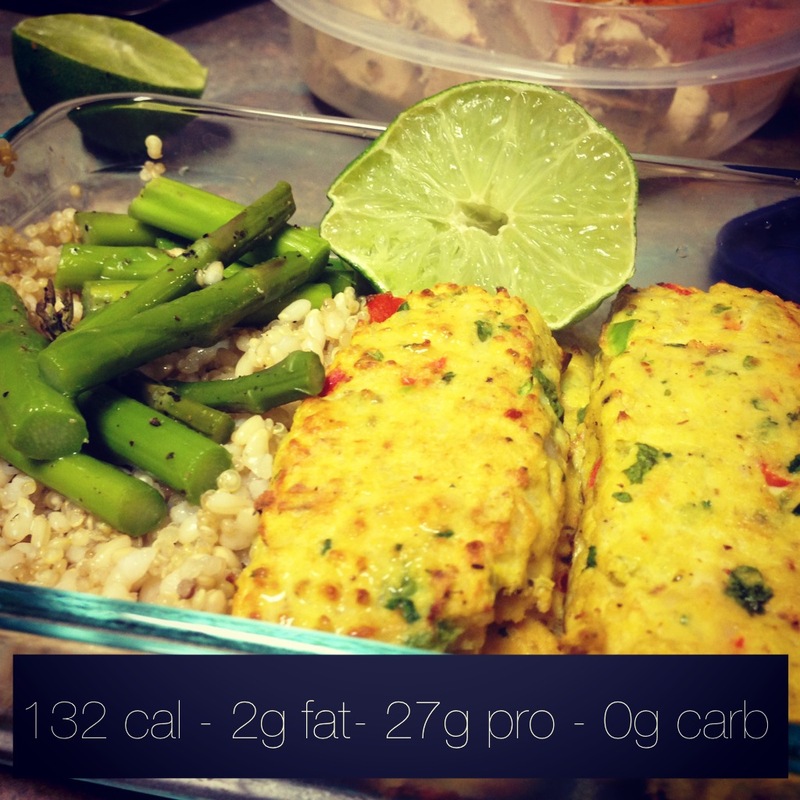 Have your meals mapped out ahead of time so you don’t have to be in that situation. This is especially important for those of you with hectic schedules – always being on the go rarely allows you time or place to cook. Not only that, but if you don’t have it planned, you can lose track of time and completely forget you haven’t ate in 6 hours. Which, believe it or not, is NOT good! I always plan my day for 3 meals, 2 smaller meals, and a “dessert” or snack just before bed – so I’m eating about every 2/3 hours. Doing so keeps my metabolism going and hunger in-check. You’re much less likely to binge on meals or be tempted by bad food laying around if you’re always satisfied. While this is one of the most important keys to a successful diet – it’s also where people fire the most excuses! Prepping food is much easier than people make it out to be. Make enough dinner to allow leftovers for lunch the next day, throw some almonds in a snack bag, always have an apple on-hand, or use your Sundays to prep food so you don’t have to worry about it the rest of the week! You can always spare time, so kick that excuse. 15-20 minutes at the end of the night to prepare your next day’s food is by no means as impossible as people make it out to be. It will pay off BIG time in your health and fitness goals…and not to mention save you MONEY! #5. Not tracking what you’re eating. Since I just told you eating 7+ meals a day is a good idea, I’d better follow up with this one. If you’ve been keeping up with my posts, you’ll have already read that I’m a food tracker. I always have an idea of how many calories and macros I’m taking in. This works well for me because my biggest problem with food has always been just eating way too much of it. 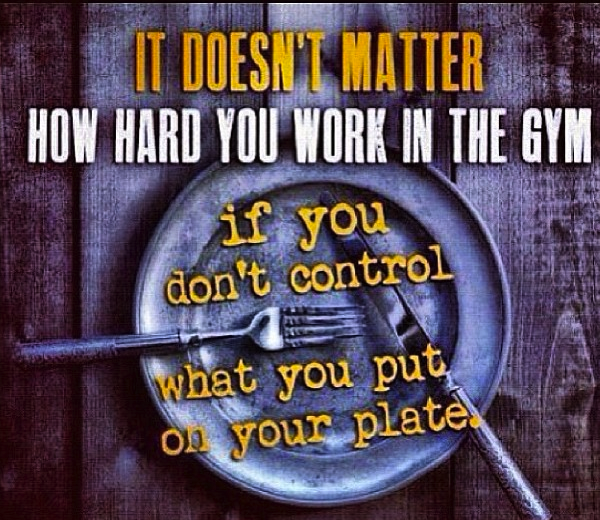 I can’t help it; I love to eat…so if I’m not aware of how much I’m taking in I will just continue to do it! Doing so also keeps me on track because it has me paying attention to nutrition labels. You will find yourself eating a lot less “crap” as you track. 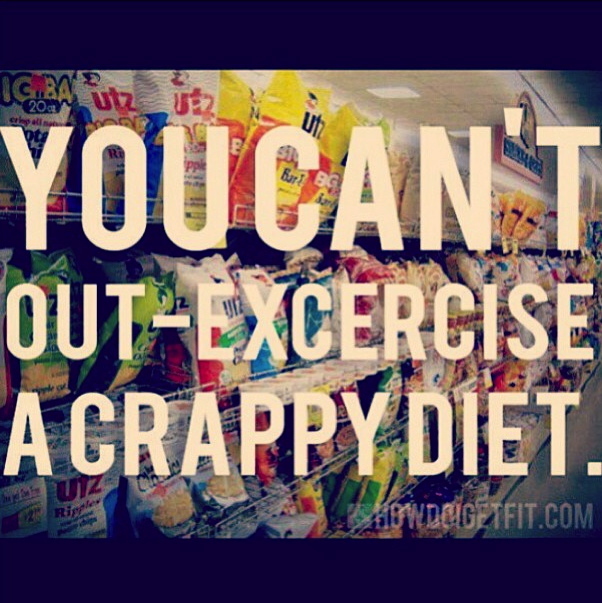 “Crap” food will not only take up a lot of calories, but will also leave you unsatisfied and miserable! Maybe counting isn’t your thing, but at the end of the day weight loss boils down to calories burned vs. calories consumed. If you don’t think counting is going to work, at least keep a food log. Write down what you ate and how much of it. Then you can track what’s making you feel good and/or bad and see what food groups you need to get more of. For example, I found that limiting breads, starches, and dairy really helped me feel and look better – so I’ve found different ways to get those nutrients in. But most importantly remember it’s different for everyone – find what works for YOU. I use applications on my phone to track these things, but there are lots of Internet resources as well. If all else fails, there’s nothing wrong with an actual pen and paper! Whatever way you choose to track, just make sure you’re doing it. You don’t have to do it forever, but when you’re first starting out it’s important in order to get you better educated on what you’re taking in and help you get into a healthy rhythm. It will also help keep your portions in-check, menu balanced, and weed out the “grazing” we tend to do throughout the day. #6. Not drinking enough water. This is probably one of the most common (and crucial!) mistakes people make. Water has so much to offer regardless of what your goals may be. We’ve all heard “8 glasses” a day (8 oz each) but it’s the one thing you can truly never have enough of. Since our own individual needs will vary on numerous factors (exercise, climate, body comp, etc), I suggest just always having a glass or bottle on-hand and sip away during the course of your day. I drink around 2 gallons a day, but I also work out vigorously, live at a high altitude, and reside in a dry climate. Most individuals may not need as much. When it comes to eating, you would be shocked to know that most of the time when your body thinks it’s “hungry” it actually just needs water! A good habit to get into is drinking a glass before you eat. This is especially important in the morning because your body has depleted most of its water supply. 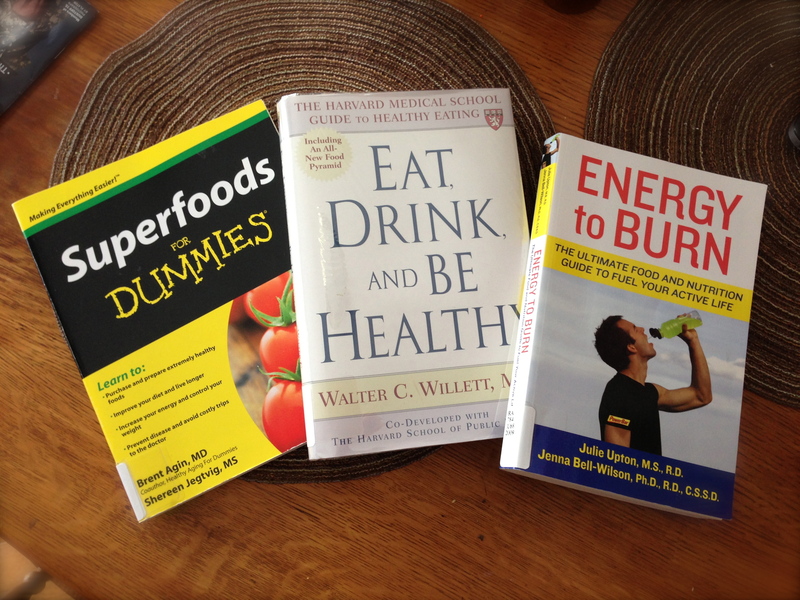 Water is also a key component in helping your body run food through its system. Staying hydrated will keep things clickin’ like it’s supposed to – increasing your metabolism and leaving you feeling great. In summary, you may make a million trips to the bathroom but it’s worth it…you’ll feel so much better, I guarantee it (plus the bathroom trips are extra exercise!). Rumor has it that cold-water helps kick your metabolism over warm – so throw in a few ice cubes while you’re at it! #7. Not tracking your progress. As much as you’re not going to want to have anything to do with your first few progress pictures and numbers…make yourself do it! Nothing is more motivating than being able to see your progress. Not only that, it’s great to be able to look back on. A lot of people get sucked into only tracking the number on the scale – I highly discourage you from doing this. Why? Because you’ll look at it and think that if it’s not going down you’re not making progress. Progress is NOT in the numbers! You can weigh the exact same weight and have a completely transformed body. Muscle weighs more than fat so as you lose excess fat and gain muscle, it’s completely normal not to see the scale fluctuating. I don’t care how badly you don’t want to take pictures – it’s a must to keep yourself not only motivated but also accountable. It’s hard to let yourself slip when you can see the progress you’re making. Sharing your goals will not only hold you accountable, but also those around you. Let them help you by letting them know what your goals are. They will then not only know what to expect, but will also (if they’re good friends/family) avoid providing you with temptations. If you’re family, you’ll end up making changes together because you feed from the same bucket. Even if you don’t live together – those you spend a lot of time with will likely start making healthier choices with you simply because they’re around you so much. Once you get it out there that you’re challenging yourself, let the competitive drive in you take over and prove to yourself and those around you that you can do it. Take pride in the challenge you’re setting out for yourself! #9. Eating too many processed foods. Eating healthy will come much easier the more you can weed processed foods out of your diet. Stick to the edges of the grocery store and try eating only fresh food and produce for a week. Can’t pronounce an ingredient? Stay away. Don’t fall into the “100 calorie, fat-free, low-calorie” trap. It’s usually processed to become that way and is in-turn, doing less good for you. Try eating less of the real thing, instead of more of the fake stuff. Once you get used to eating real food, your body will reject all the other “crap” you try to feed it. 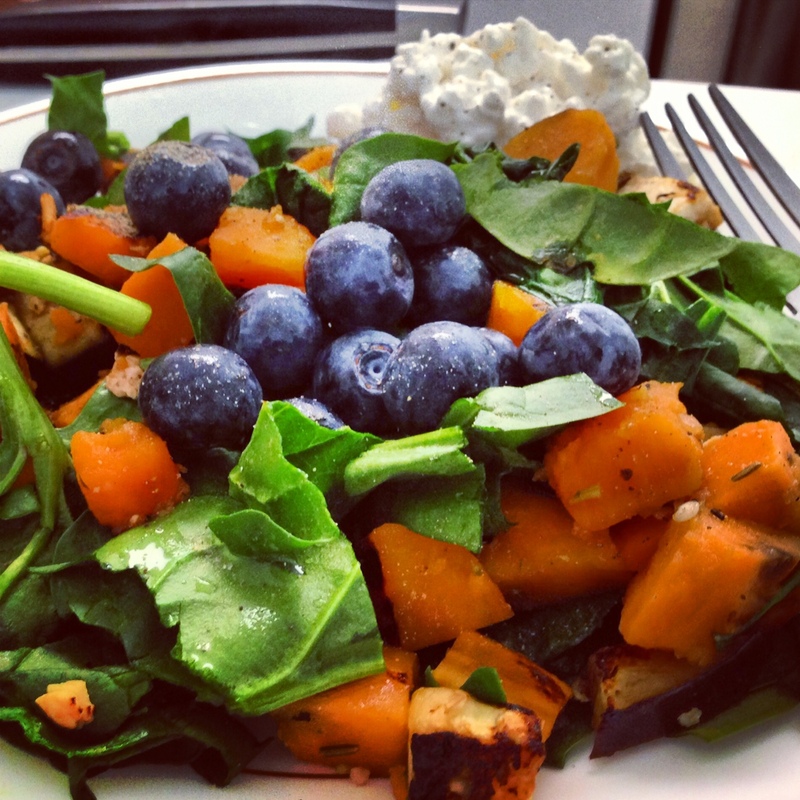 Clean eating is a lifestyle – and just as addicting as junk eating (only much more rewarding)!! Lots of great recipes out there to try – all it takes is a simple “clean eating recipes” google or Pinterest search. A great resource I use is my fooducate app on my phone. By scanning items, it gives a grade for the product and lets you know if it is highly-processed or hiding ingredients. I highly recommend it for anyone, especially those just starting out. I think we’ve all gone for this myth before. Skipping meals in order to indulge in others…or thinking it will somehow benefit us in the long run. It couldn’t be farther from the truth. Skipping any meals, especially breakfast, will send your body into starvation mode. When your body thinks it’s starving, it’s going to hold on to any fat it can and slow your metabolism down as a result. Not to mention it’s a completely unrealistic lifestyle. Who wants to spend half their day starving and the other half stuffed from binging? This doesn’t make for a healthy OR happy person! It’s instead a recipe for one grumpy, hungry, sleepy, and even dizzy person! These are just a few of many mistakes people make in their diet. There are so many opinions out there about what is and isn’t the right thing to do, it can be confusing and completing frustrating as someone trying to make steps towards losing weight and living healthier. My answer to this is that there is no magic formula. No recipe that fits everyone. So keep it simple, keep it clean, and find what works for YOU. Lucky for us, the produce section is large and colorful so find foods that suite your own taste buds and get creative in the kitchen! 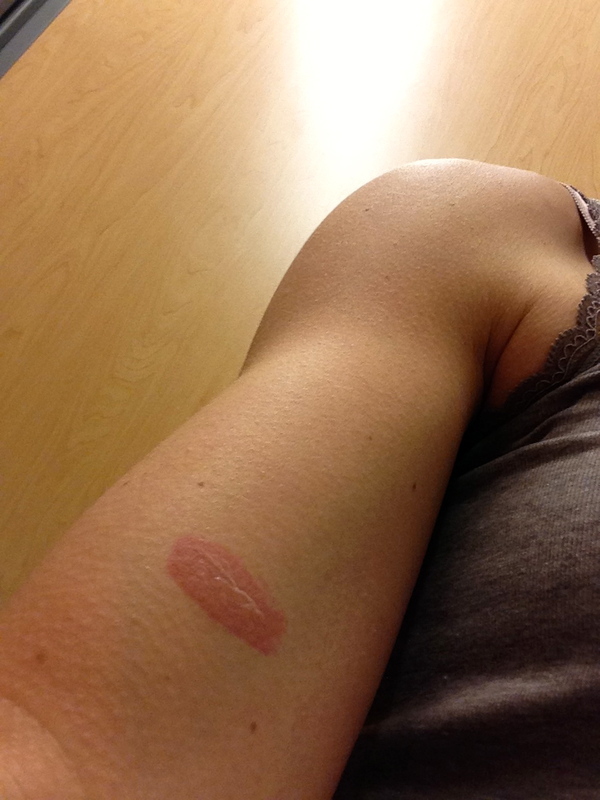 Learn to love cooking and the fact you can see what’s going in your body. Love your indulgences, too…because we’re all human and deserve it every once and awhile! It’s a process and no healthy, long-lasting change will happen quickly. Focus on the progress you’re making instead of the road that’s ahead of you. Like all things you’ll have ups and downs and days that all you want to do is swim in chocolate and give up. Stick with it and focus on small, simple changes. These will take you farther than any drastic, short-term change will. I’ve gained a huge passion for cooking, nutrition, and everything in-between…so if you have questions, comments, ideas, or anything else – please don’t be afraid to reach out! Meanwhile, this KILLER workout will get your heart pumpin! 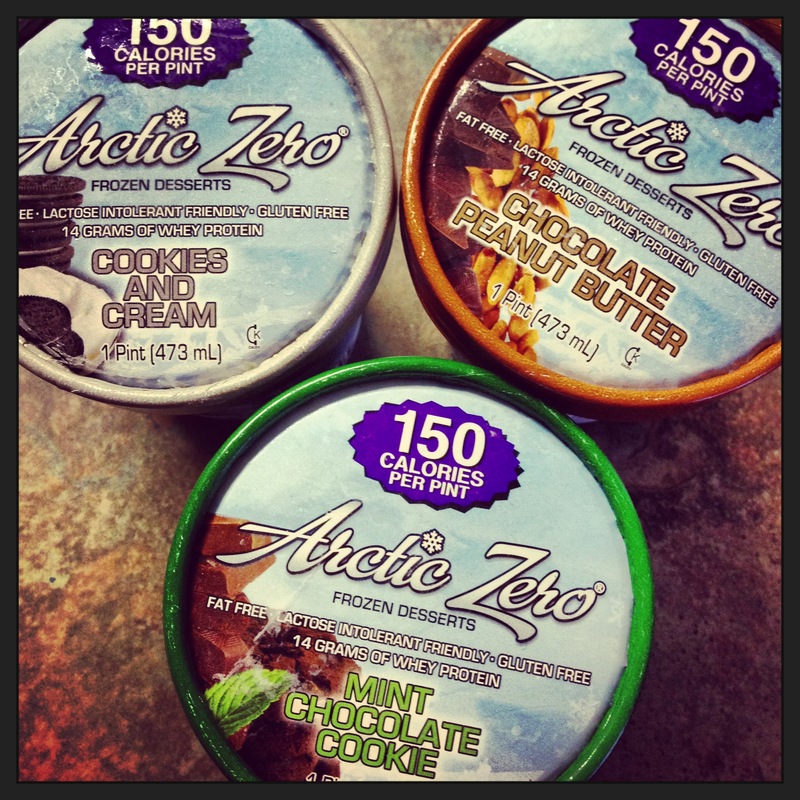 Splurged on some Arctic Zero, this stuff aint cheap up here but I’ll gladly pay up to be able to down a pint of ice cream guiltlessly! Some people think this stuff is too bland – I usually add dark chocolate, peanut butter, pretzels, fruit, or other yum yum’s to spruce it up. I’ve even mixed it with greek yogurt to get some protein in and give it a thicker consistency. 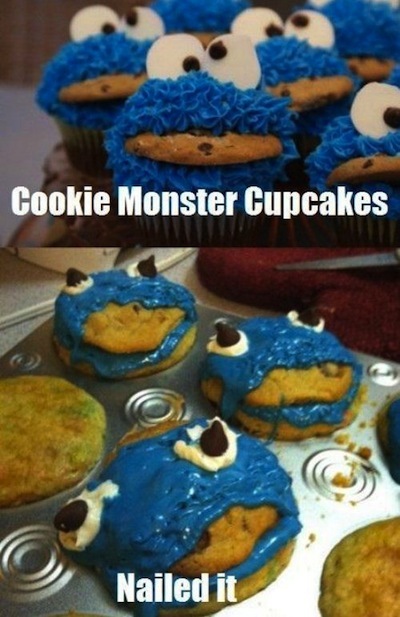 Like i’ve always said, mistakes are to be embraced in the kitchen! So, *embracing* while also crying because I wasted 1/4 cup precious PB2 (also not cheap) on these bad boys. I tried getting a little too fancy with substitutions and it came back to haunt me. Unfortunately these fell under the category of tasting as bad as they looked. Channeling my inner-dolphin for an early morning AMRAP! 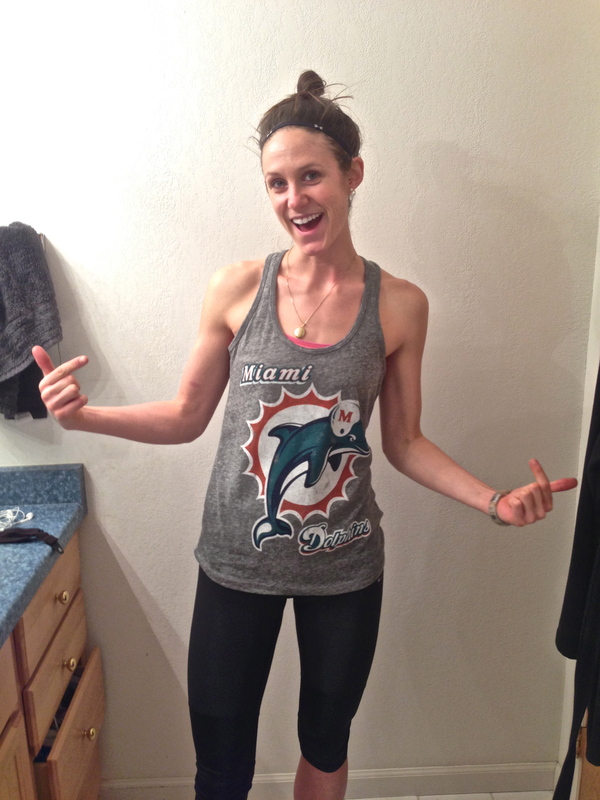 I found this gem (tank top) at Forever 21 of all places…I obviously had to buy it. 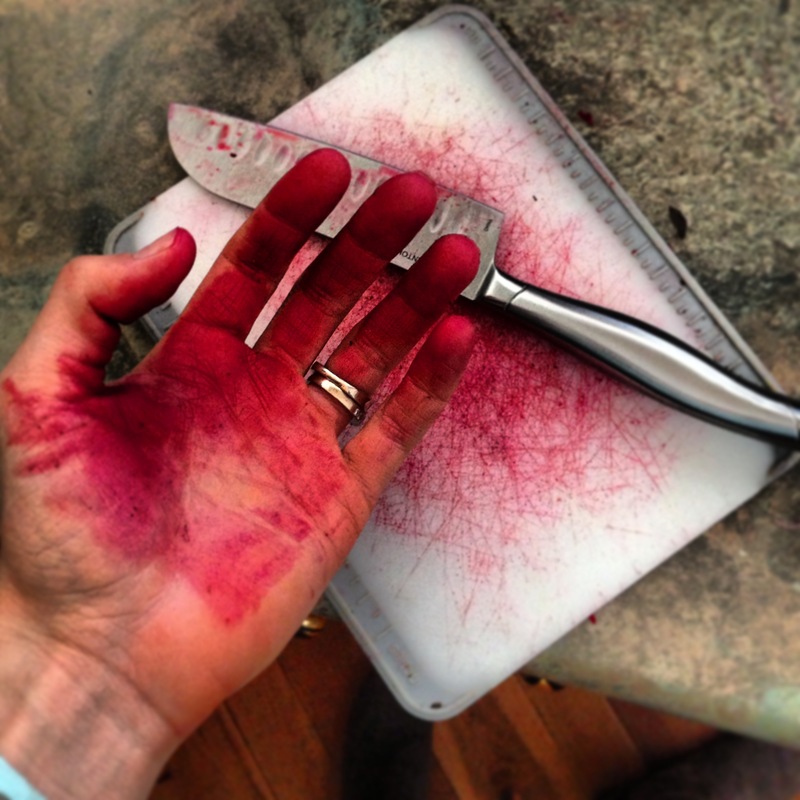 Beets made an appearance in my kitchen last week, and not without a trace. (Tyler will say nothing in our kitchen makes an appearance without a trace – I disagree) Nutrition comes at a high price these days! 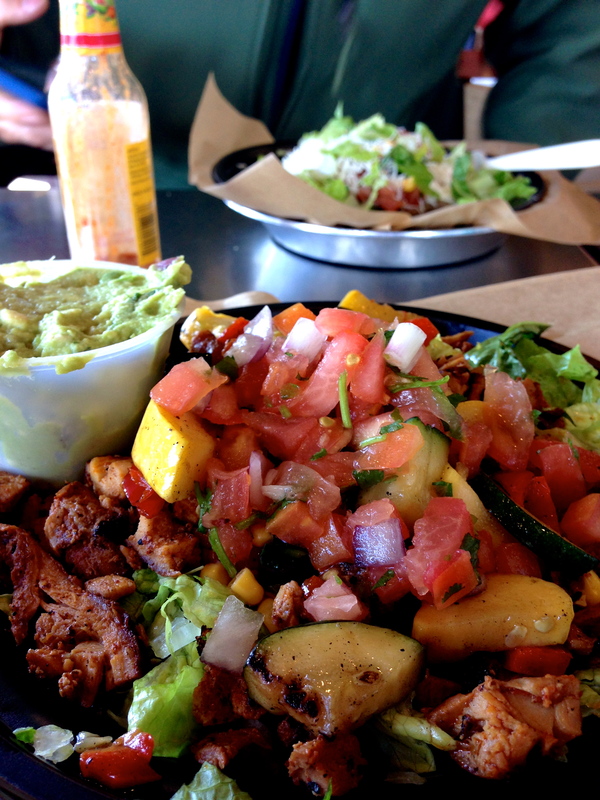 We always plop by our favorite places when we finally get out into a civilized town – this time it was QDOBA! Nom nom nom my favorite. 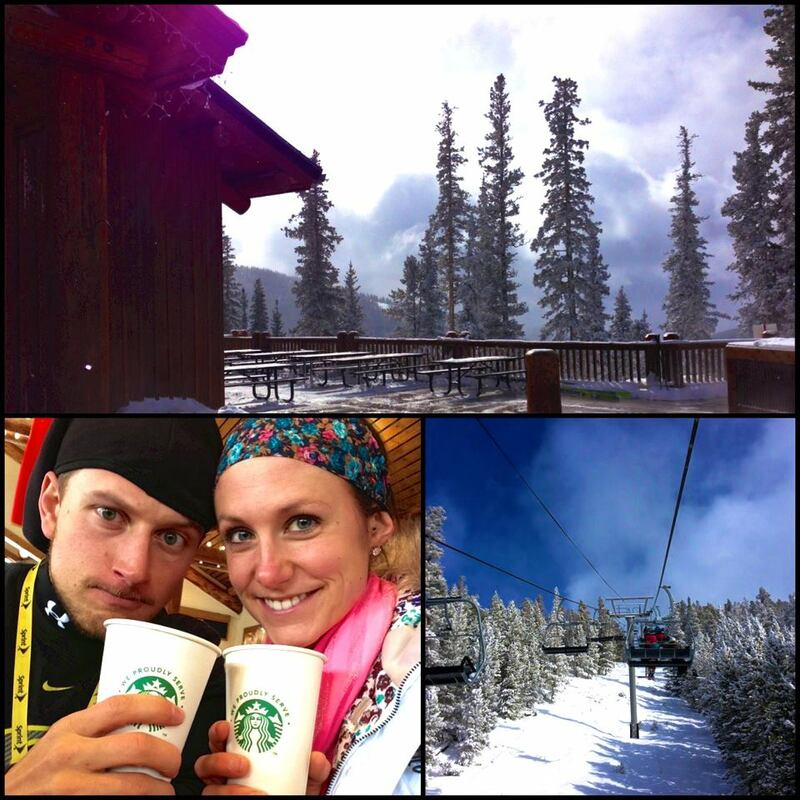 Annnnd of course we’ve been hittin the slopes as much as we can while the snow’s still around. We’ve had some awesome snow days and it’s finally starting to warm up so babies like me aren’t freezing their tails off! Can you believe it’s March already?!! Hope everyone’s doing well and surviving the endless snow storms that seem to be hitting everywhere BUT where they need to be (the mountains). 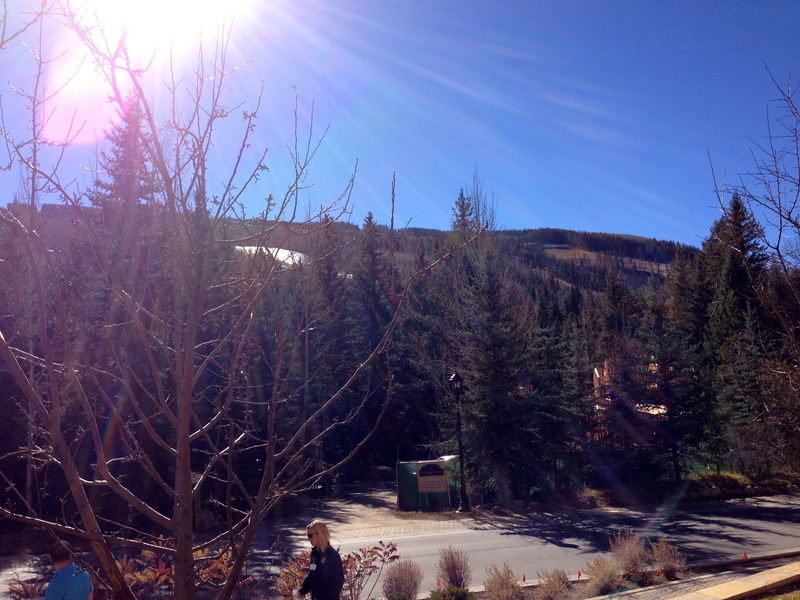 The locals around here do nothing but complain about “bad snow”! 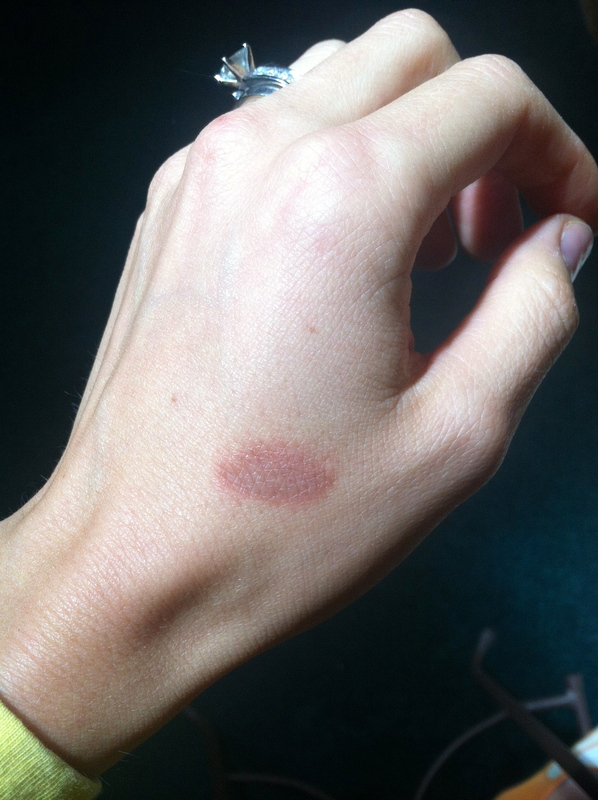 Mistakes you’re making…in the kitchen. So you’ve improved your gym habits. Now it’s time to clean up your act in the kitchen. 1. We don’t use substitutions. How many times have you thrown out the idea of trying a recipe simply because you didn’t have, or didn’t like, one of the ingredients? Let me reassure you there is almost always a replacement for an ingredient. It’s as simple as googling “__ substitute”, investing in a substitute book, or even just using your brain! In baking, applesauce, yogurt, and bananas are all common methods of replacing staple ingredients like butter, oil, and sugar. Spices are also often interchangeable (or completely removable) and are never worth giving up on a recipe. Once you start to cook more often, you will begin to understand what certain ingredients bring to the table and replacing them will become second-nature. If you’re stuck because you don’t like a certain ingredient, consider swapping it for something you DO like. For example, don’t like chocolate chips? Use chopped nuts, raisins, or m&ms instead. Not a mushroom fan? Swap it out for another veggie. Don’t eat meat? Omit the meat! Be creative! This can be piggy-backed onto the previous point. Throw around ingredients, adapt recipes, brainstorm new ideas…create your own masterpiece! Cookies turn out like bricks? That’s ok! Keep experimenting and trying new things. Don’t limit yourself to other people’s taste buds. We’re all different so make it fun and try combos that accommodate your specific wants and needs. People almost always order different items on a menu when you eat out, so doesn’t it make sense that we may need to adapt someone else’s recipe? 3. We don’t use spices. Something I’ve made a goal for the next year is to use more spices. I’ve become pretty plain jane but it’s amazing what just a little spice can do to your food, and for your health! Cinnamon, chili/cayenne peppers/spices, cumin, turmeric, oregano, ginger, thyme, rosemary, and garlic are just a few of the powerhouse spices that do wonders for your body as well as give your food a yummy kick. 4. We don’t embrace our mistakes. We all have our moments. Growing up I read 1 tsp baking soda as 1 tablespoon and enjoyed a nasty homemade pizza. My mom is a saint for even pretending it “wasn’t that bad”. I’ve also had (continue to have) my fair share of pancake-cookies, overcooked eggs, burnt meat, and just overall ugly dishes. No one becomes a chef overnight…so enjoy these moments, learn from them, and laugh it off. It may take me a few days to “laugh off” cayenne pepper being sprayed in my eyes last weekend, however. Opening a new bottle or bag of anything at this altitude is never a quiet affair, so I should have known better. But SHOOT that peel just wouldn’t come off the lid so I really got my head into it and before I knew it I was running around the kitchen screaming for cold water…which conveniently would NOT come out of the faucet at that moment. It was really quite comedic had you not been the person with burning eyes. Last thing on embracing mistakes…don’t forget to taste it before you throw it out. It may look like a mess but it doesn’t always taste as bad as it looks! 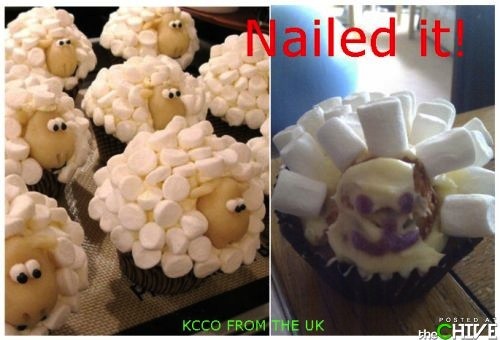 These “nailed it” pictures always kill me – because we’ve all been in these shoes before. 5. We’re not storing our food properly. Tomatoes are best kept at room temperature? Refrigerated tomatoes lose their flavor quickly. Carrots keep for 2 weeks when uncut, but once peeled and cut they need to be eaten within 3-4 days? Apples give off ethylene gas that ripens fruits and some vegetables. Need an avocado or banana to ripen quickly? Stick your apples nearby! Strawberries are not to be washed or cut until ready to eat? They’re good for 3 days in the fridge. Fresh cranberries only keep for a few days in the fridge but keep for months when cooked? Blueberries aren’t to be washed until they’re ready to use? Moisture hastens the deterioration of these already fragile berries. Bananas, once ripe (yellow w/ brown spots), should be moved to the fridge? The cool air will slow the ripening process. Apples may be stored either in the fridge or at room-temp, but they will stay fresher longer in the cool air. Store in a paper bag loosely closed. 6. We think we don’t need a cutting board. Maybe it’s just me. But when you’re only cutting a few things and especially when you’re only cooking for one, sometimes it’s easier to cut things in your hand…or on the countertop. Not only is this unsanitary and dangerous, those few times will add up and create a nice looking design on your surface. 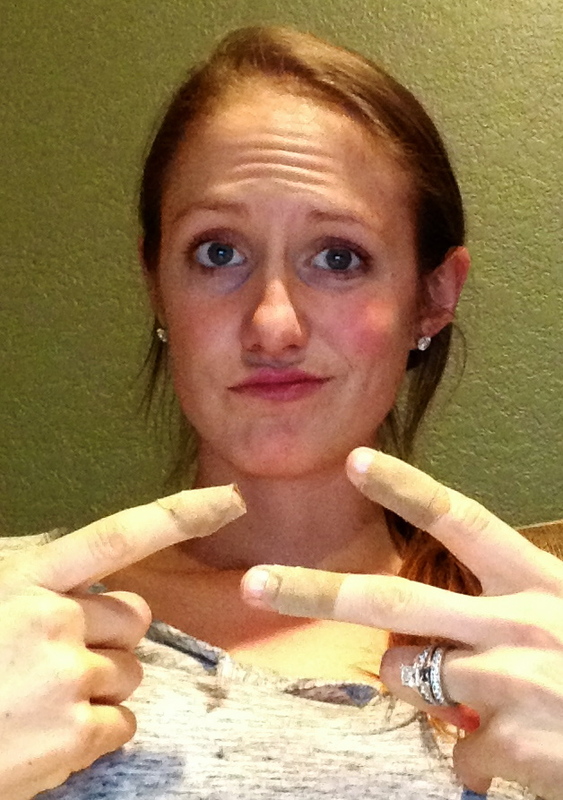 I seem to cut myself even when I DO cut on a board, so you can imagine the band-aids I’ve gone through when I try to get fancy in my hands. People with kids need be especially careful with this because you never know when your little booger is watching you…and habits are quickly picked up! You don’t want them thinking it’s okay to hack away on your countertop NOR do you want them cutting things in their hands! Yikes! 7. We’re not using oven mitts. 8. We’re not reading the entire recipe before we cook. This is a crucial error for several reasons. Everyone is subject to human error. It’s common that the author will forget an ingredient in the list, but include it in the directions – leaving you s*** outta luck! In addition to this, there often times will be preparation that needs to be done before you start cooking. It could be as little as preheating your oven or as tedious as marinating overnight. Nothing is worse than being in the middle of your cooking (guests waiting), and realizing you needed to have refrigerated something for 2 hours. Do yourself a favor and read everything first. 9. We’re not tasting as we go. BIG no-no! Lots of things wrong with this. First off, different people have different tastes – so whatever portions the recipe calls for, especially with spices and seasonings, it will likely need to be adjusted to what you like. Secondly, getting the right consistency will vary with the types/brands of foods you’re using. For example, certain brands of dairy are going to be much creamier than others. When using substitutions this step is especially important. Perhaps the most important factor here is the many variances of cooking times. Different appliances, ingredients and a million things in-between will make your cooking time different than everyone else’s. Keep an eye on your food and taste.as.you.go!! 10. 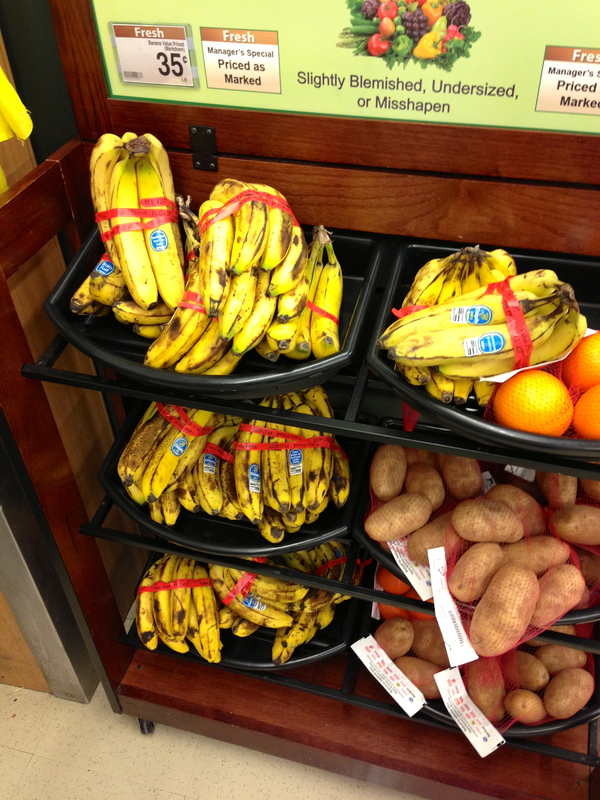 You’re throwing away “bad” bananas. Dooooon’t do it!! Mushy bananas are a bakers dream – they provide the perfect sweetness and consistency to add to recipes like muffins, cookies, breakfast dishes, and of course that yummy banana bread. Not only do bananas add great flavor, though, they also can be used as a healthy substitute to things like eggs, oil, butter, and even flour. Not a baker? Un-peel your ‘naners and freeze em for the perfect smoothie! Saying this, you can imagine my excitement when City Market puts these puppies on sale for .35 a pound!! I bought about half of these (honestly). These are just a few of many mistakes all of us make on a daily basis. I love this list from Cooking Light (stole a few from here)- it’s a longer, more comprehensive list and focuses more on specific cooking mistakes. Be sure to check it out and start impressing your guests…because if you’re anything like me, you’re guilty of about half of these. ANYWAYS, I’ll leave you with some new recipes/workouts and pictures to tempt you into trying them! 🙂 But first, lets take a quick look into A) my best friend’s THIRD trimester belly and B) my water-loaded end-of-the-day tummy. Can you even guess which one is which? I’m not sure what’s more ridiculous…how much water I drink or how little her belly is! Mistakes you’re making…in the gym. Anytime you head into a workout, keep in mind this quote, “Fitness is intensity dependent, not time dependent.” While low-intensity cardio may burn you a few calories during the time being, it is overall not very effective and let’s be honest…so BORING! High intensity intervals, even for as little as 15 minutes, requires effort and oxygen that will not only burn more calories in the moment, but it will also keep your body working and burning calories for up to 48 hours after your workout. Learn more about this concept of EPOC (excess post-exercise energy consumption) and EPOC training here (http://www.bloomtofit.com/epoc-training). So while I do applaud the fact you decided to spend time on the elliptical as opposed to the couch…the fact you can read and chat with your neighbor while working out is your first red flag. Second red flag is that it took you over an hour to get a work out in. I’m here to break it to you that while you were fluffing around at a slow, steady pace for 2 hours, I got a 20 minute high-intensity interval training workout done and am on to the rest of my day. So the next time you hear someone say they spent “so much time” at the gym, don’t be so impressed! Finding workouts like these are as simple as googling, “(insert amount of time) HIIT training workouts”. Don’t have a gym? Add “at-home” to that Google search and get rid of those excuses for good! Quality over quantity – engrain that in your mind. This concept of quality over quantity also applies to lifting and performing exercises. A lot of people sacrifice quality form in order to perform more. Let me tell you that while you may be pounding out a large number, if you’re not using proper form you will not only hurt yourself, but you’ll also be missing out on the many benefits these exercises are intended to give. If it means going down a few pounds on your weights, so be it – you will look a lot less cool trapped under a bench press than you will with a few less weights…and I bet those heavy plates on the sides of your bar will be a lot less appealing once you throw your back out. Point is, toss your pride aside and do your research on the exercises you’re performing. Be smart and do them right to maximize your muscle gain, fitness potential, and prevent injuries from keeping you out of the gym. I hate to be the bearer of bad news, but those machines that are all lined up at the gym are providing you more rest than they are anything else. They isolate movements, restricting your natural range of motion and prohibiting your body from fully engaging. As a general rule of thumb, stick to dumbbells, kettle bells, bars, med balls, bands, and BODY WEIGHT exercises to keep you on the right track. You want to maximize your results by engaging as many parts of the body at one time as possible, so don’t you think an exercise that begins with you sitting down is probably not a good start? 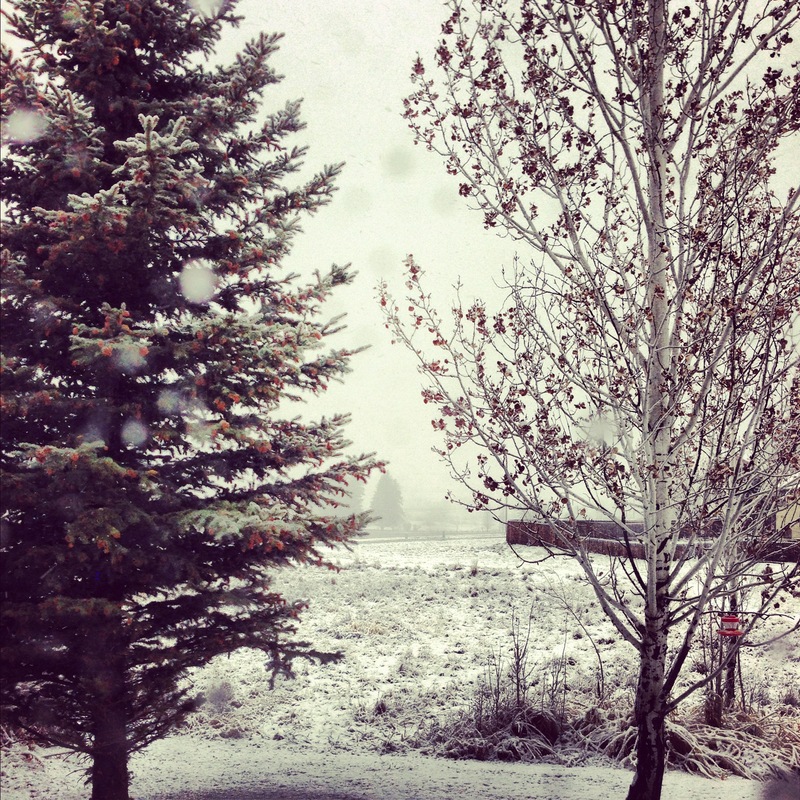 Okay, so above all else…heading to the gym is supposed to be fun! How are you supposed to be motivated to get to the gym if things are never new and exciting? Between the classes I attend and the workouts I self-create, I’m always heading to the gym with something a little different than the time before. Granted, it is beneficial to bring the same workouts around to track your progress…but if you’re doing the same routine for more than 3 weeks, I would suggest switching it up to keep things interesting, prevent overuse injuries, and continue to challenge your body. As much as we want to believe the treadmill really does do magic and can accurately calculate our calories burned, chances are it’s incorrect. The only true way to tell how hard you are working is by measuring your heart rate. There are lots of fun devices and gadgets to help you track this as you workout, including Polar-brand watches and products like my new Micoach Adidas HR monitor (thanks, mom and dad!) that syncs to my phone. Find your target heart rate zones and monitor yourself through your workout to get the most of your time in the gym…and better yet, an accurate calorie reading! We’ve all fallen into this trap at one point or another. We do a million crunches expecting to eventually get those six-pack abs…and a good looking rear-end is the result of a few donkey kicks…right? NO! Isolated exercises simply don’t burn enough calories and your body works as a whole, so the more functional, full-body exercises you can incorporate into your regimen…the better. Engaging your whole body is a huge metabolism booster and will get your heart rate up so you can burn more calories. More calories burned, the thinner that layer of fat lying over your muscles will become. That fat will not disappear by doing isolated exercises. Get your cardio in, and use as many full-body-strengthening exercises as you can! Ladies and gents, let how you look be motivation for you whether it’s trying to revamp whose in the mirror or maintain it. I realize not everyone grew up in a pair of spandex like I did, but hiding who you are under baggy clothes isn’t the way to go. Switch from sweats to a pair of shorts, or even just short-sleeves. If you’re feeling up to it, get some tight-fitting workout gear and watch them start to fit you differently as you tone up. Think about it…are you motivated to do anything when you wear sweats? Camp out, watch a movie, grab some snacks…that’s about it. Give yourself even more reason to get to the gym by investing in some new gear and for goodness sakes stop hiding yourself under all those clothes! We’ve all said it before…“I’ll figure it out at the gym”. A crucial mistake many people make is failing to PLAN. A good way to avoid this trap is go to bed with your bag packed, meal laid out (if you go in the morning), and workout ready to go. Not doing these things gives you waaaay too much wiggle room. Next thing you know you created an excuse, pushed your workout to “another time” or maybe you actually did make it to the gym but had no idea what you were going to do and wasted half your time figuring it out. This is one reason why classes are nice because the instructor does the hard work for you…but if you’re doing your own thing, plan ahead and have your workout laid out before you even head out the door. I only have 45 gym-minutes in the morning before I have to start heading to work, so making the most of my time at the gym is crucial. I head to bed with my workout already mapped out so I can get up, get on my way, and pound it out. Fail to plan, plan to fail. Although cardio is an important part of the weight loss equation, it is most certainly not the only part. I will admit going through this phase…but I’m so glad I’ve learned and moved away from this mindset! Girls: lifting weights and strengthening your body isn’t going to make you “big”. We simply don’t have the testosterone that men do to bulk up with big muscles. But what it will do is tone you up and help you achieve your weight-loss goals by BURNING MORE CALORIES! Yes, that’s right. Muscle burns up to 3x as many calories at rest than fat, so start taking those selfie flex pictures and see your muscles grow! This goes for your diet as well, but finding a workout routine catered to your OWN self is so important in creating a healthy lifestyle. Just because your friend can pound out 4 miles on a treadmill and look great doesn’t mean it’s for you. There are lots of ways to get good exercise and build strength so don’t ever think there’s a one-way street to being fit. Some people just aren’t meant to run distance. Some people aren’t designed to be good sprinters. In fact, some of you just aren’t runners at all!! Maybe you can tear it up in the pool or on the bike. Like to dance? Sounds like zumba may be up your alley. Need some stress relief? Try kickboxing. Whatever it may be, find your niche and what drives you and motivates you to get your sweat on. In my opinion, this is the BIGGEST factor that holds people back from accomplishing their goals. The minute you start treating food as fuel and stop treating your body like a waste basket, you will not only feel better, but you’ll finally get to see your results pay off. Nothing is more frustrating than feeling like you’re putting in work and getting nothing out of it. I’ve always worked out and been active, but I was oblivious for so many years as to what my poor eating was (or wasn’t) doing for me. I promise you that eating clean will be the best and most rewarding change you ever make. Good habits are just as addictive as bad habits but MUCH more rewarding…so stop making trips to the gym out of guilt and start rewarding your body with exercise instead of food. I eat clean because I want to see results, I want to feel good, and I want to stick around for awhile. Although my fitness routine IS much more focused now than it was before, it’s my eating habits that have allowed me to finally look like I work out….and nothing is more motivating than seeing your hard work pay off. Progress is addicting, so cling to every bit that you have. Stay tuned for the next parts of this “mistakes” series. Meanwhile, is it seriously almost February? Happy Friday! We all have our staples. Our go-tos. Items that, when removed from our life, would cause a ripple in our routine and a little/lot of anxiety. Sometimes these are negative things, somehow making their way onto a New Year’s resolution every year…but they can also be good things. Things that help us create healthy rhythms and accomplish our goals. That being said, I’m dedicating this post to my own personal set of go-tos – focusing on the items that keep my food and fitness tickin…because who needs to know my naughty list anyway? My lulu pants. The most comfortable, sweatable, and loungable things I own. From my astro pants that once were form-fitting and now serve as sweatpants – to my wunderunders that get worn everywhere from the gym to my couch to a base layer under my ski pants. A little pricey compared to your local Target knock-offs, but a very high-quality product that, for me, gets their moneys worth within a week! 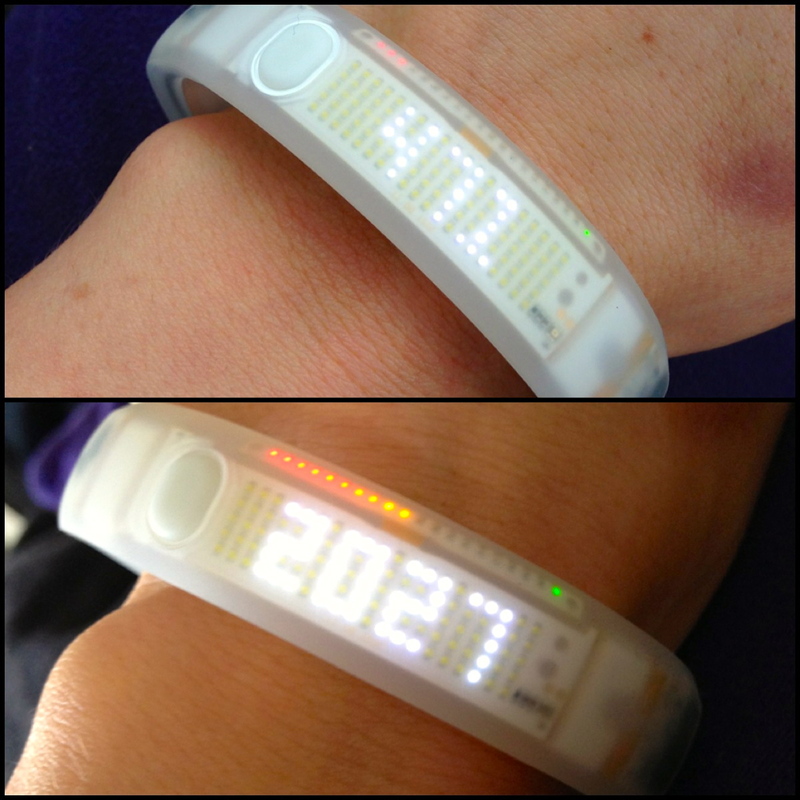 Nike Fuelband. Something so attached to me I ended up taking this “water resistant” wristlet for a “water proof” spin in the pool a few times. It managed to stay alive for a few months before I had to say my goodbyes and try to make the nice list for Christmas. Turns out I made the cut (thanks mom and dad!) and now have some new white wrist-candy to fill the naked feeling. Check out more about what this band is all about at the link above…but a quick synopsis is it tracks your activity throughout the day, including steps and calories, while also doubling as a watch. By the simple click of a button you get an awesome display that shows you all of your statistics as well as progress towards your goal. Nike training club. Another application for my phone that provides numerous workouts doable both at-home and in the gym. Other fitness applications included in this go-to category include: nike running, iwod fitness, bodyrock, sworkit, workouts, and ab workouts. There are millions out there for you to download…notice how your excuses are slowly being weeded out? PINTEREST! My oh my what was the world even like before this beautiful website? A hub of ideas for absolutely anything, and the ability to pin these ideas to your own digital corkboard. It’s like google, but better…because pictures are involved. I’m always on here looking for recipe and workout motivation. Check out reaganrambler’s pinterest board here – and begin your very own pinterest journey! I’d also sneak Instagram on this number, because it’s similar in that you can explore everything, have a feed with only people you choose to follow, and share things yourself! As many of you know who follow me, I love using my instagram to share recipes and workouts as well as find them from other people! Don’t have instagram? Download the phone application now and follow me at eblank1…often times I’ll post recipes there before I do on here. PB2. I’ve already dedicated an entire post to this love story. No need to waste your time twice. Fage 0% plain greek yogurt. We buy 3-4 TUBS a week and still manage to run out. Besides the obvious use of serving as yogurt, I also use this as a healthy substitute in baking/cooking. Dips? Yep. Sour cream? Pshhh, this stuff is waaaay better. Never ever will you find me without this in my fridge. Great source of protein! Water bottle. Most people do the triple-pat before they leave the house – keys, wallet, phone. My triple-pat goes phone, keys, and… bottle. Water has SO many benefits for you! Next time you think you’re hungry, down a glass of water and see how you feel. A lot of times your body just needs water! First thing in the morning drink a glass of water and see your breakfast intake go down. Feeling sick? Drink up – water keeps your system working and will help flush those nasty germs right out of you. But why wait ‘til you’re on your deathbed to start? Drinking cold water will aid in keeping your metabolism up and is guaranteed to make you feel better throughout the day (or your money back). Scale. More-so my kitchen scale but I’ll go ahead and throw the bathroom scale in there, too. 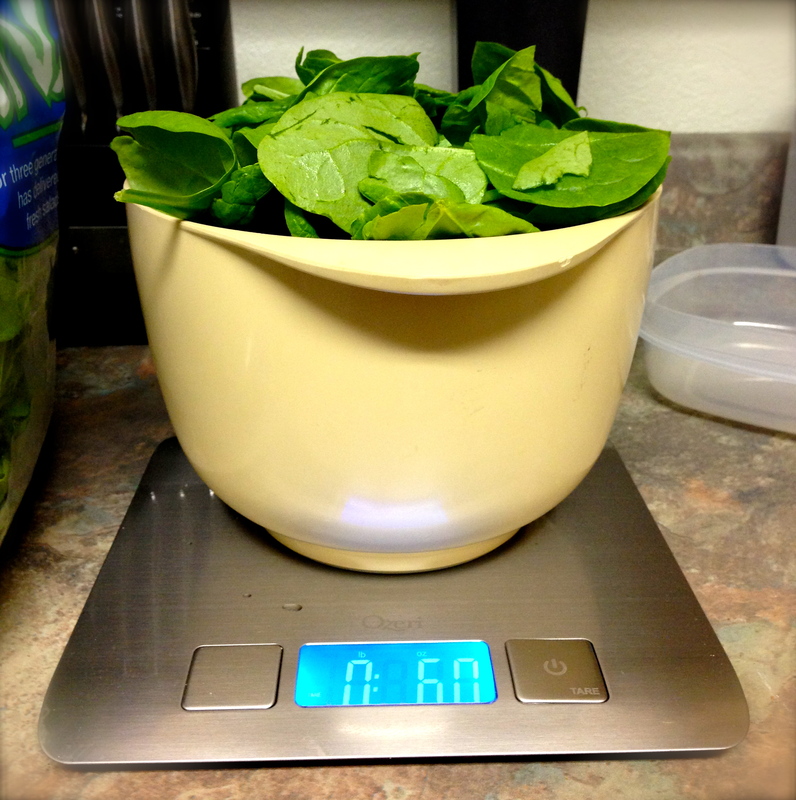 Being able to accurately measure portions leaves the guessing out of how much you’re eating. Not to mention you can easily convert portions when you’re not sure how much “10 oz” is and you need it in a recipe. Beware of sticking too close to your bathroom scale, as your goals are about much more than weight (muscle weighs more than fat!). 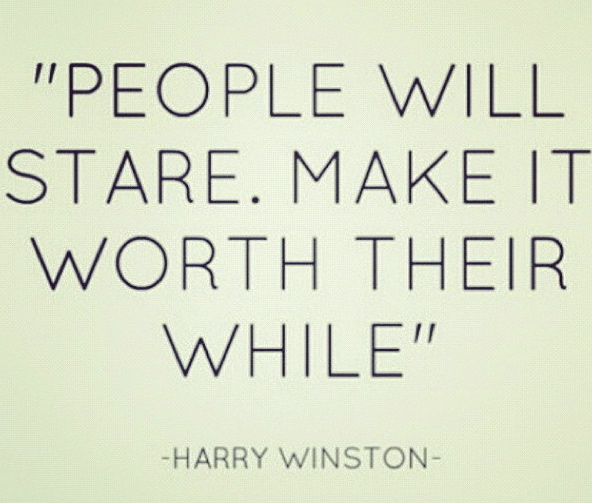 Focus on how your clothes feel and how you look. It is, however, a good idea to keep an eye on it. Pay attention to weeks at a time, though, not days…and be sure to weigh-in at the same time – I (and Dr. Oz) would suggest in the morning after you’ve gone to the bathroom but before you’ve had that first glass of water (ahem, #8). 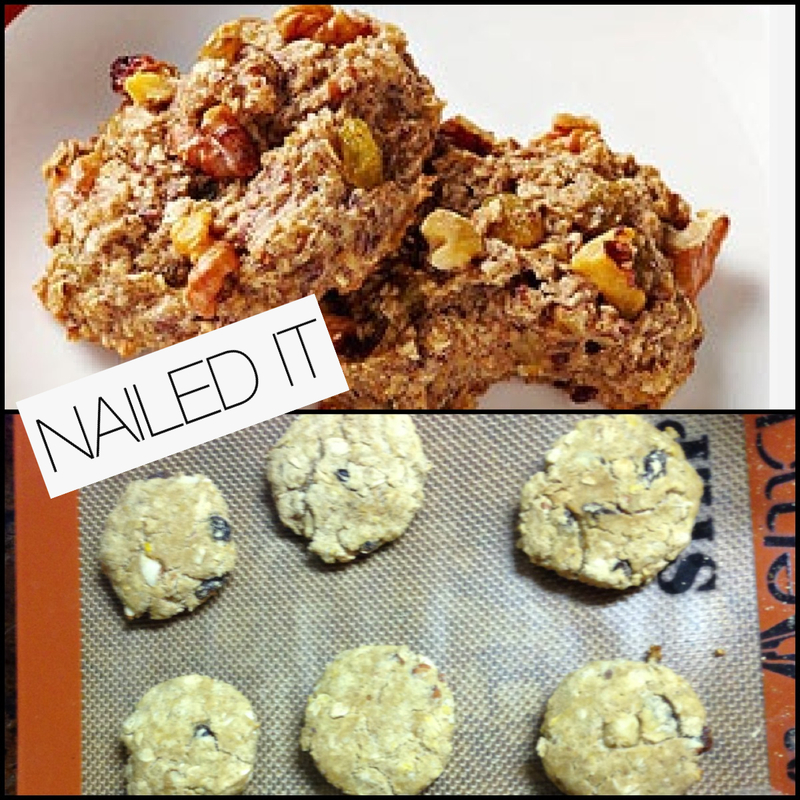 Last but most certainly not least is…oatmeal! If you’ve even briefly viewed my recipes you will surely have already seen this coming. Not only is it incredibly nutritious and filling, it’s versatile. 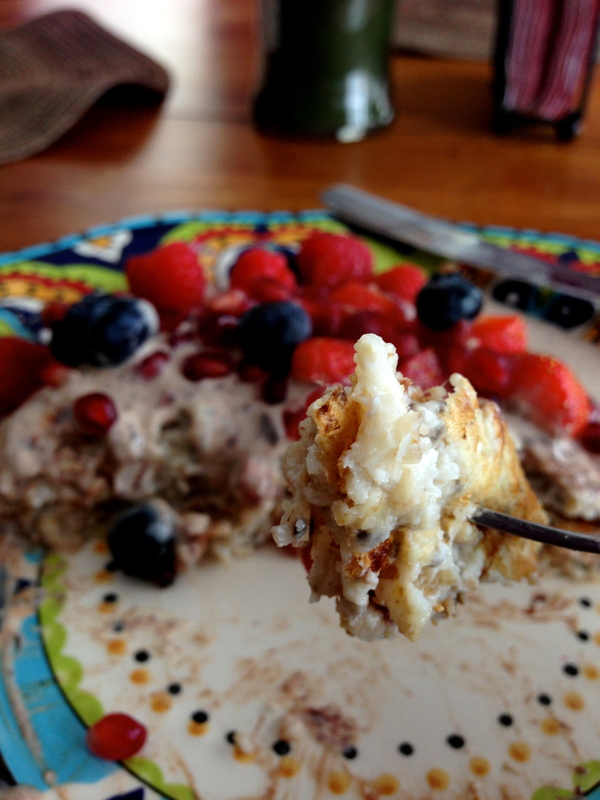 I’ll eat it cold as overnight oats, hot with a few egg whites, throw it in a smoothie, use it in pancakes, grind it and use it as flour…the options are endless! There you have it. My top 10, so-to-speak. Honorable mention includes almond milk (this really probably should have made the list), sweet potatoes, headbands, and spandex. 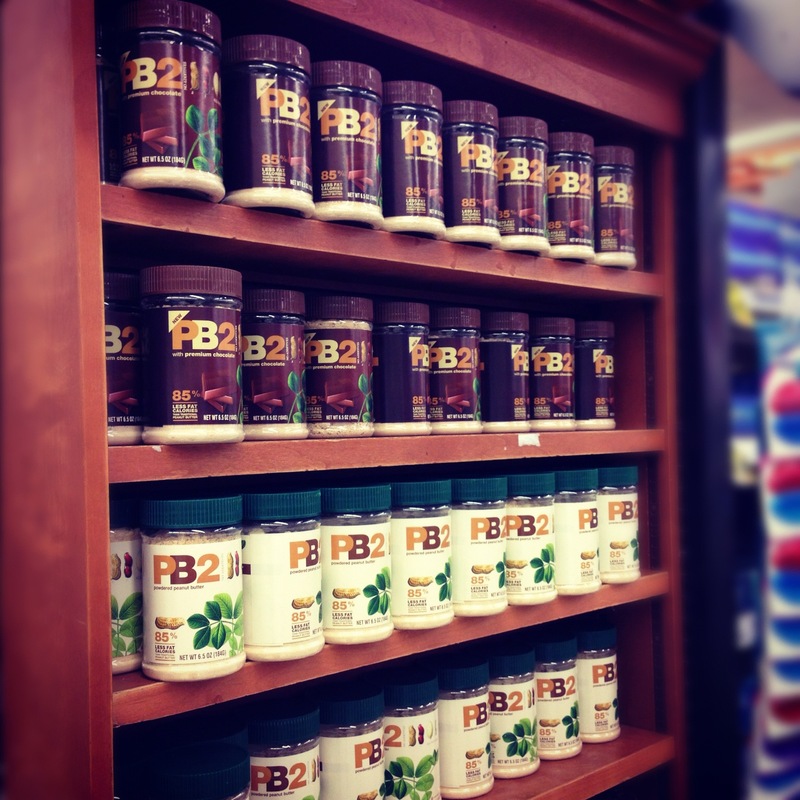 What are some of YOUR fitness/food staples? 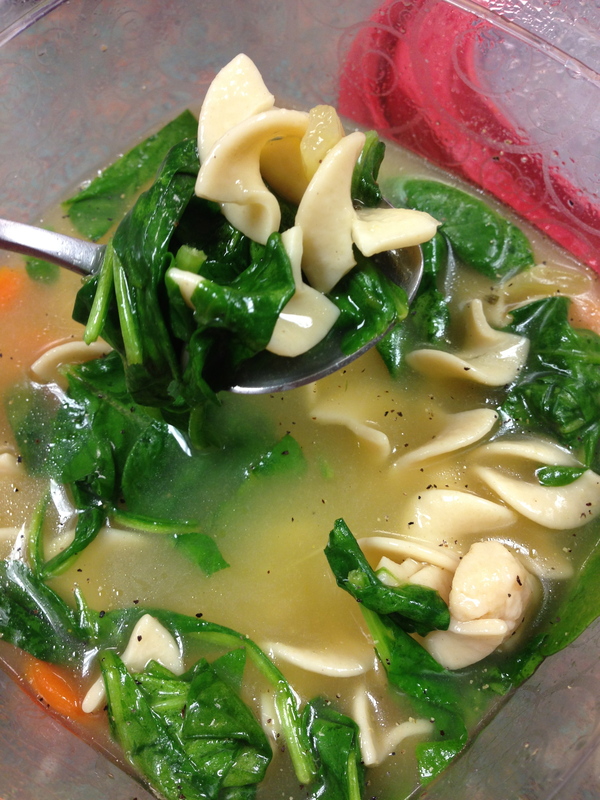 In other news, who knew spinach could spice up canned soup so much? I got lazy with food prep one night last week and decided to throw a can of chicken noodle soup in my lunch bag. Decided I could spruce it up by throwing some spinach in, too. Turned out awesome! 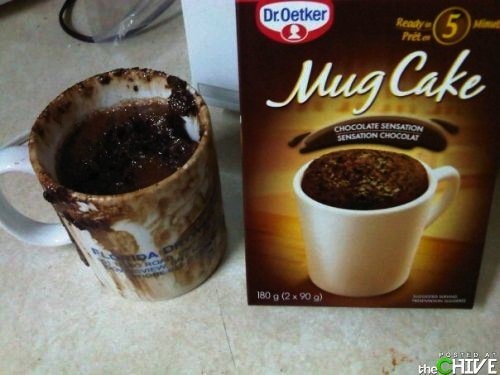 You’d never know it came out of a can! 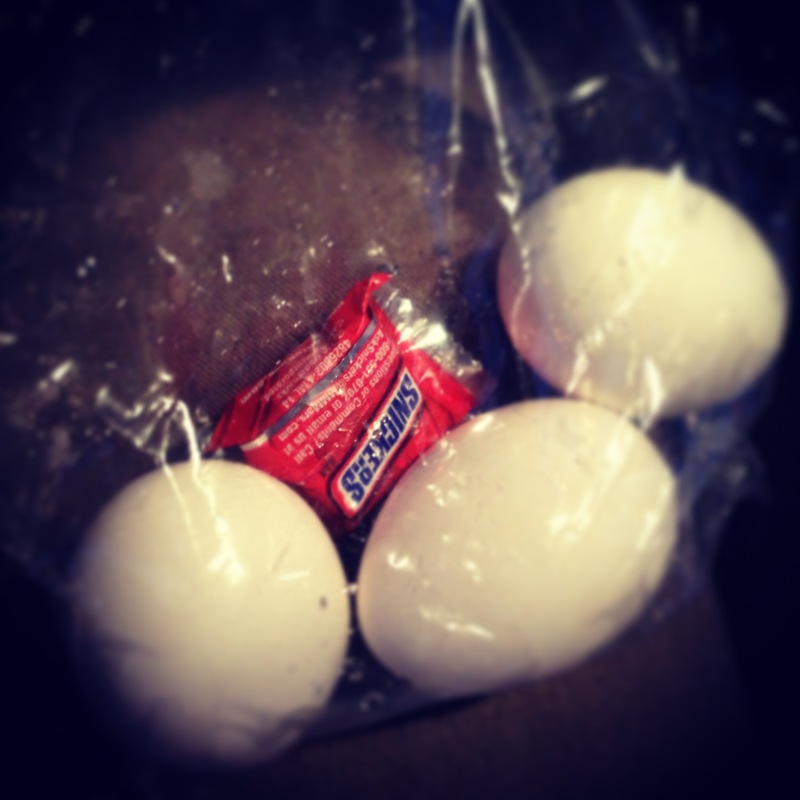 Also supporting me in my wellness goals this week – my husband -because I sure as heck didn’t put a snickers in my bag of eggs. Am the only one who wishes Christmas fell in different seasons around the world so I could make a living as a traveling gift wrapper? As my loving husband will be quick to tell you, I love all things wrapping. All the festive paper, shiny bows, pretty ribbon, gift tags…all outlets for my Christmas spirit and creativity to let loose. Hit the Christmas music and I’m in the zone. Maybe it’s because I grew up in a house where my mom would label her wrapping room as “Santa’s workshop” and I’d cherish the moments I got to jump in and help. Or maybe it’s the perfection she had with her presents, and the beautiful display of what was *probably way too many presents* under the tree and in our stockings. Either way, I fully own the fact that passing the gift-wrapping section of the store does give me that feeling that most women get when walking by shoes (they never have 10.5s anyways)…and if it’s reversable paper yes, I’ll buy it. But my husband can grumble all he wants because at the end of the day, he’s opening presents on Christmas. how precious are these reindeer?! annnd we’re still using the wedding ribbon in December. While I may be getting highs finding shiny bows and gift tags, the rest of America is likely getting highs off of normal things like cookies and other holiday-related food. Despite our desperate attempts to convincing ourselves that there’s some nutrition behind that slice of fruit cake and glass of egg nog, the holidays just aren’t meant to be friends with your diet. Lucky for you, though, they are meant to indulge and enjoy. The health nut in me would love to now segway into how to limit those holiday cravings but I’m instead going to skip towards the next American trend: New Year’s resolutions. We all have them. Not always health-related, but since New Years conveniently follows a month of holiday indulgences and predecesses warmer weather and less clothing…the resolutions usually tend to aim that direction. Unfortunately, there are more of these that fizzle out than that which truly last, so I wanted to share some insight on how to not only make those changes happen, but make them last. 1. Create your resolution for the right reason. 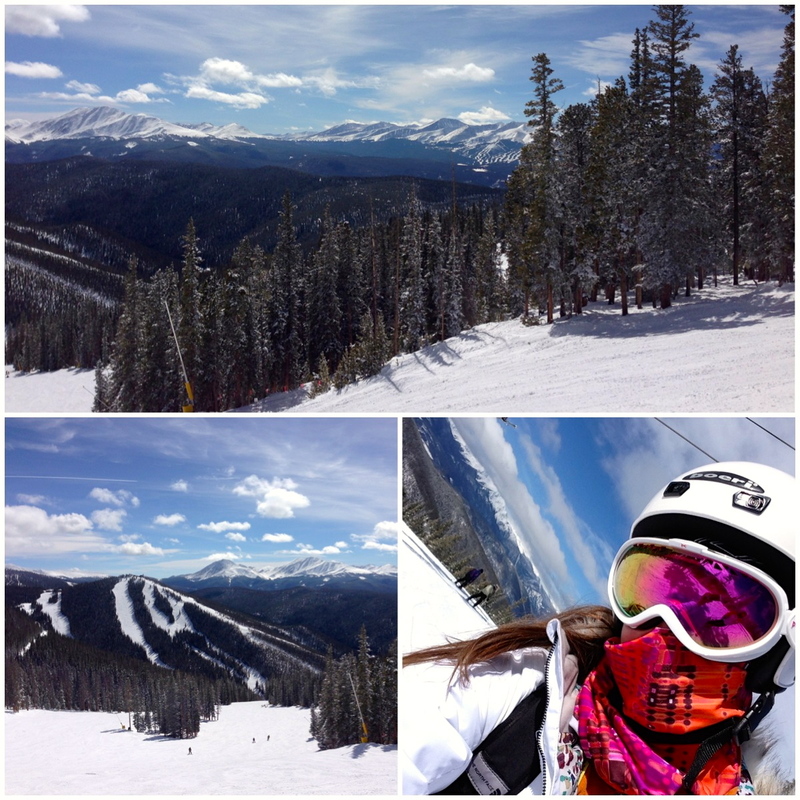 It’s great you want to look good in a bikini for Spring Break…but how about the rest of the year? Doesn’t a lifetime of health, happiness, and feeling good sound much more appealing? Make it about the long-term from the get go. 2. Be realistic. Create small goals that lead up to your ultimate goal to be sure you’re creating an attainable resolution. You know better than anyone else what your limits are. Starting small will help give you the confidence that you can make a change. Progress is the greatest motivator there is, so allow yourself to have it by not shooting beyond the stars. 3. Make it about you. You’re doing this for yourself and no one else. If it’s not you who gets to feel good about the results, what motivation is there? 4. Patience. Progress that sticks is gradual. I think back to how I lost my weight recently – what started out as just wanting to look and feel better by eating right turned into weight being shed off of me I didn’t even know I had to lose. Yes, I lost around 20 pounds…but that was over 5-6 months and never happened in more than maybe a pound a week. If you’re looking to lose a drastic amount of weight or change your diet, sometimes you can lose a lot of weight in the first couple of weeks…but as your body adapts to this new routine it will slow down and that’s no reason to get frustrated! Healthy weight loss is measured in only a pound or two a week. This applies to all types of goals, however. Stay patient and focus on what progress you are making as opposed to what progress you have left. 5. Dedication. “Whatever you choose, do it fully with a passion and child-like enthusiasm.” -Dr. Oz. I love this quote. Go after your goals with FIRE and stick to it. Choose a resolution you’re excited about. Making goals out of guilt isn’t the road to follow. Example: okay so yes, you ate your weight in Christmas ham this holiday season…don’t let your unbuttoned jeans be the sole motivation for a change. If anyone is thinking of creating a health/food/fitness related resolution and wants some help in what direction to go or where to start, I would be more than happy to help you out…just send me a message or leave me a comment! Happy happy holidays everyone…I unfortunately work Christmas Eve, Christmas, New Years Eve and New Years Day sooo insert thumbs up here. But hey, I’ll be making money while you all lose it! Glass is half full! Skinny Alfredo Sauce **I made this two nights in a row…so good! ANOTHER great thing I whipped up this week was the shredded chicken below. I saw on Pinterest that an easier way to shred chicken is using your kitchen aid and let me tell you…I am NEVER going back to hand-shredding! All I did with this was threw some frozen chicken in the crockpot with a little chicken broth and marinade. After it cooked about 4 hours I took it out and threw it in the kitchen aid. While it was shredding, I strained the broth to remove the fat and returned it to the pot. After adding the chicken, it all soaked right up and was deeeeelicious. It’s super simple and makes great leftovers to throw in a sandwich, salad, or whatever else. Give it a shot! ….I swear this really happened. We have visitors in our yard quite often. After a week of early morning in-house workouts during Thanksgiving, Tyler and I decided that instead of continuing to wake him and the neighbors up with my double-unders in the garage, we should start a new routine of hitting the gym together in the morning. Our gym offers a few early TRX classes that we wanted to try, and who doesn’t love getting their workout out of the way before the day even begins? It was our first week trying out TRX and it will most certainly not be our last. If you haven’t given TRX a try before, I highly recommend it. The different exercises that are incorporated using these ropes engage your entire body and strengthen your core in nearly every move. One of our workouts was themed around the “12 days of Christmas”. We had 12 exercises to complete (see picture below) and we began with only the first one. Next we did exercises 1 and 2. Then 1,2,3. 1,2,3,4. All the way up to 12…just like the song! 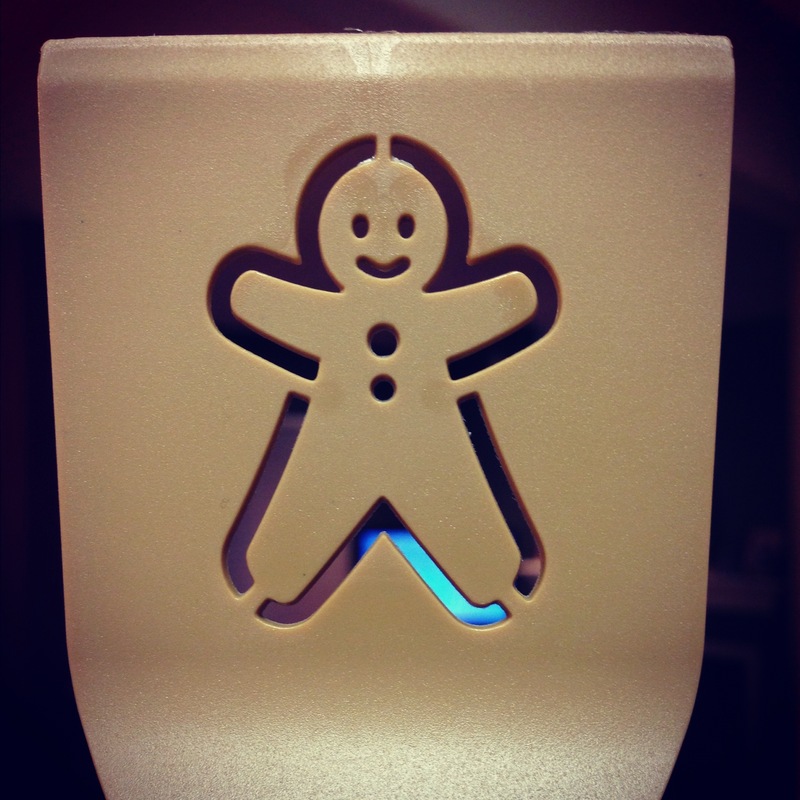 I thought this was so creative – what a fun way to bring the Christmas spirit into the gym! Try this on your own and come up with your own 12 exercises! 1. You may have just gotten up and yes, it may be 5 degrees outside…but park farther away than you usually do. The circles you’re making in the parking lot waiting for rockstar parking aren’t saving you time anyway. 3. Bathroom trips! Choose a bathroom that requires a little walk. Granted, there’s no need to hike to the next building…but take the opportunity to stretch your legs and maybe visit a few co-workers along the way. Once you make it there, choose the farthest stall. As ridiculous as it sounds, if you get into the habit of choosing the last stall over the first, the steps will start to add up! 4. Stand up. Standing will not only burn you more calories than sitting, but it will also help improve your posture and reduce stiffness in your body throughout the day. 5. Ahh, you made it to lunch. Ok, so maybe you have a job where you’re already on your feet all day and you cherish your 30 minutes over the noon hour to sit down and relax…but for the rest of us – get out of the office! It’s refreshing to leave the atmosphere of your work space and can also provide a great opportunity to get moving. Take a 30 minute walk or shop a nearby store. 6. Stop taking the elevator! You do realize that by the time the elevator gets to your floor, you could have already been where you want to be, right? Take the stairs!! Once you get into this habit, it will be hard to break. 7. Walk and talk. We all know the image…talking on the phone, feet kicked up, finger twirling around the receiver cord. Think about how long your phone conversations typically last and how you probably can be caught complaining about how you don’t have enough time in the day to be active. Lets kill two birds with one stone here. Graze while you chat and earn some bonus points. 8. Take a field trip. Instead of calling, emailing, or texting the person you’re trying to reach…walk yourself over and get some face-time. Hand-delivering messages goes beyond getting your legs moving – it’s also a great way to stay personable with the people around you. Send your next report to a further printer and mingle along the way. Some of you may be reading and thinking “pshhhh, I get such a good workout in before/after work…I don’t need to worry about anything.” But it doesn’t matter! Just because you got some activity in during another part of your day doesn’t reduce the risk of being sedentary for long periods of time. This is one reason why I love my Nike FuelBand. There’s also lots of other devices and tools that track activity, but this has so far been my favorite. It tracks your activity throughout the day and allows you to set a goal and see your progress by one simple press of a button on your bracelet. Mine has recently passed away (insert crying sad faces) after a few too many accidental trips to the pool…but if I’m nice the next few weeks I think Santa may sneak one under my tree! If you’re still Christmas shopping, consider one of these (FuelBand, Up Band, Fit Bit, etc) for your active or even non-active friends. It’s a fun way to track activity, compete with others, and get moving! I hope everyone’s Christmas shopping is going well – only a few more weeks! Eeeeek! 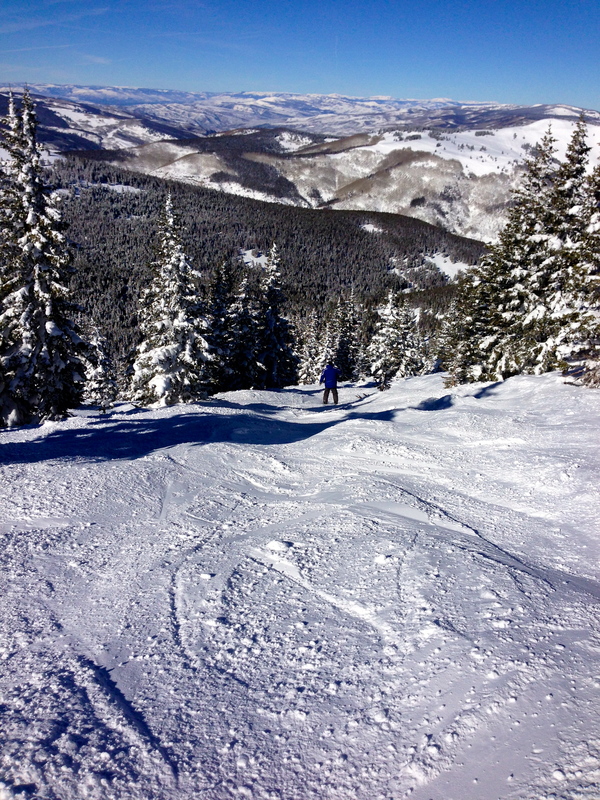 The talk of the mountains seems to always be about snow, or lack there-of…and we just got up to 14 inches this last week. 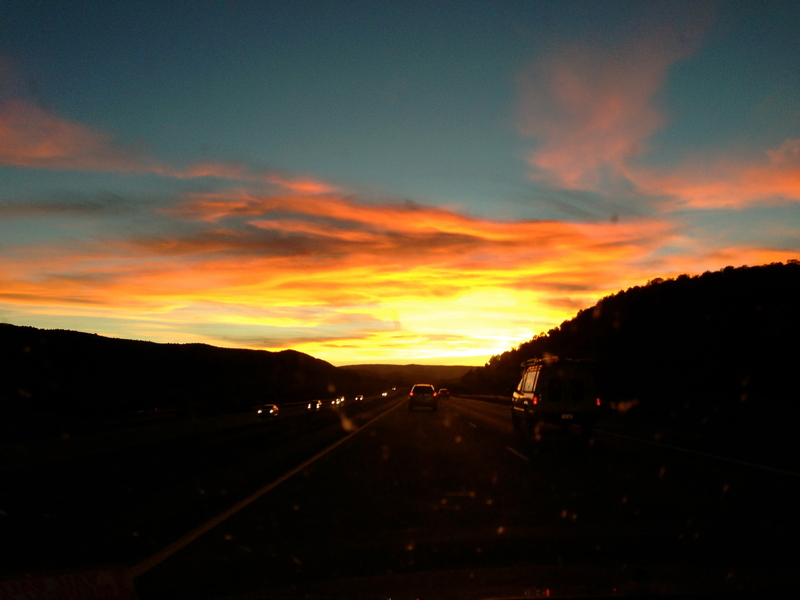 So you can imagine spirits are high up here in the Vail Valley. I love this because it helps keep me balanced. I may want oatmeal, fruit, yogurt, and peanut butter all day…but it’s important to spread the love out to other food categories and keep a balanced diet. At the gym today, I ran into a lady doing bicep curls and bench press with her baby sitting right beside her. I had to creep a picture because I think this is just awesome. NO EXCUSES! 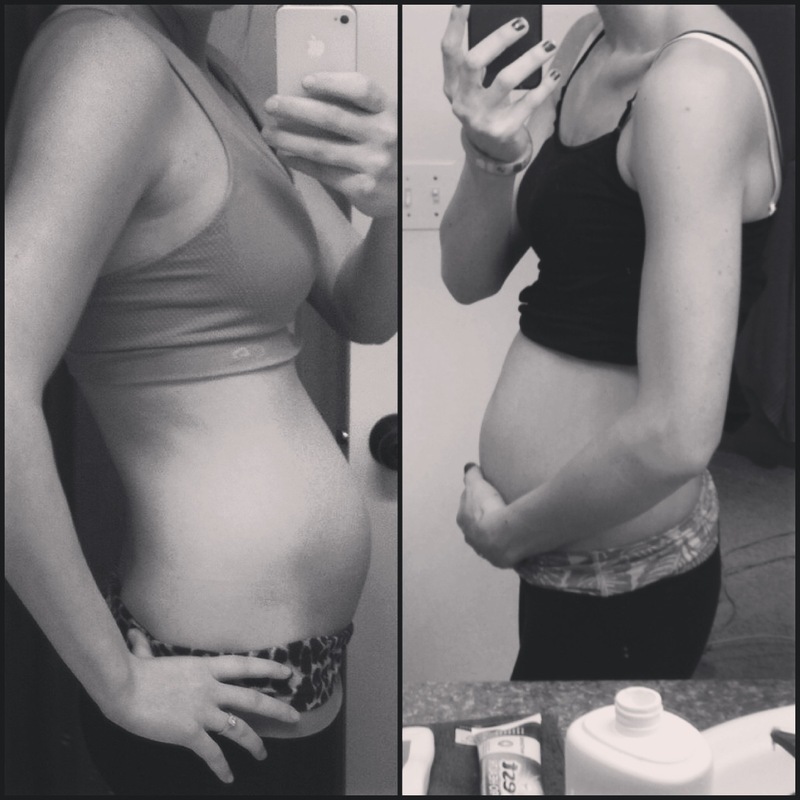 This baby is already on its way to a healthy lifestyle! She even played with her in between sets! Super mom!! That’s all I really have for you this week. Check out the new recipes added below, and don’t forget to follow my instagram (eblank1) and twitter (eblank1) accounts for more recipes, workouts, and random things in between! 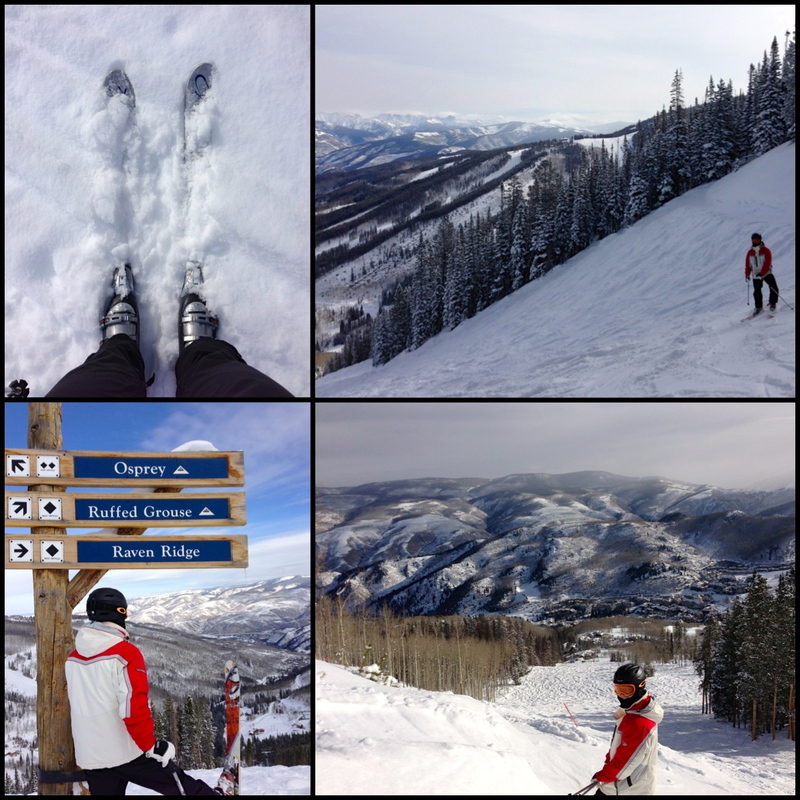 I’ll leave you with a few pictures from Tyler’s Holiday work party this weekend in Loveland. It was cowboy themed…so we scrounged up some outfits to try and fit in. I made it a Saturday fatterday by trying a little bit of every dessert on the table (thankfully, the other women at the table also wanted to do the same thing)…how cute are those cookies?!! Happy hump day everyone! Those health-conscious individuals can be found in the gym, attempting to work their way back to feeling good and sweating out all the indulgences of last week. The Betty Crockers will be in the kitchen, trying to duplicate recipes or find ways to use leftovers for the week. Of course there’s also those who see Thanksgiving as nothing more than a step closer to black friday …while everyone was making rounds 2 and 3 through the buffet Thursday, these people were strategizing their plan of attack, planning which deals they would prioritize and which items would be left for cyber monday. Look for this type to be sitting on the couch, admiring all of their Christmas presents wrapped under the tree and recovering from the bruises it took to get them there. One of the biggest faces in kitchenware and also one of my most anticipated items from my wedding registry. I couldn’t wait to get my hands on this and see what it could do. However, I do have to admit the number of times I’ve used this since getting it in July is limited to two hands. It’s best used for large quantities and I am most of the time only cooking for two people. I don’t like to cook more than I want to eat so I mostly have used my mixer only when baking for large groups, or when my ingredients simply cannot be mixed well by hand. For example: my sweet potato casserole. 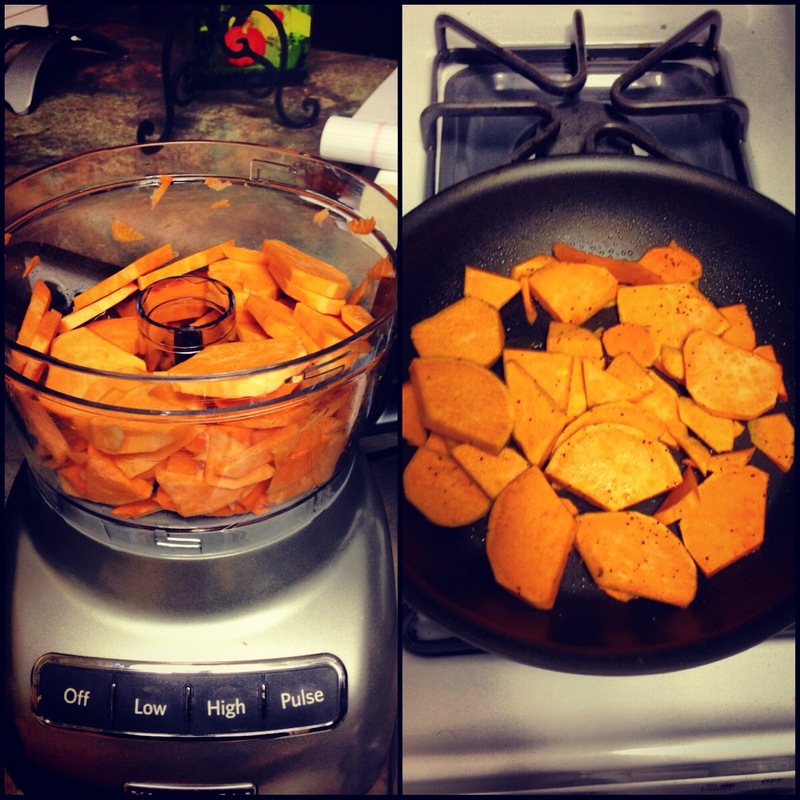 Mashing sweet potatoes, even when cooked, can be tough. In addition, any other dense foods are better off being left to the machine as well. The package comes with multiple attachments to accompany many kinds of mixing, mashing, kneading, and whisking. There are also many attachments that can be purchased as add-ons to help your mixer experience! Although I would have loved having myself a bright pink mixer, our charcoal color has been working just as well. To summarize, I don’t use it as much as I’d like but it’s definitely worth the space it takes up in the cupboard. 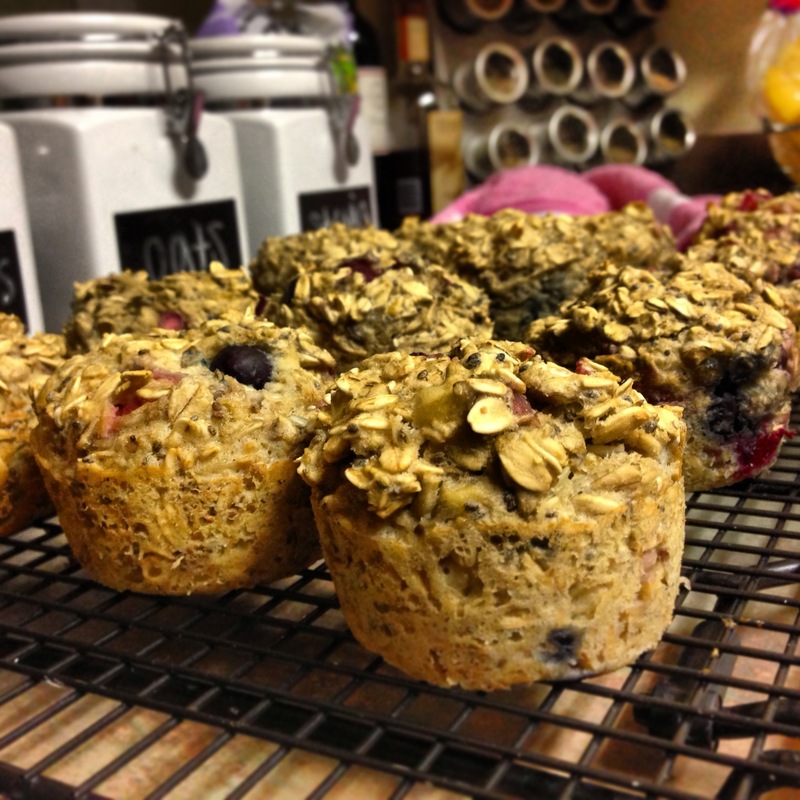 Many people dismiss investing in a food processor due to the fact they own a blender. But let me tell you it is worth the price (and space) to invest in one. Food processors come in all shapes and sizes and have many different features. My specific one here is pretty hard to beat. It comes with 3 different blades -one for shredding, one for slicing, and one for mixing. All which do so flawlessly. You can set the thickness of the slice or shred to whatever you’d like…making hashbrowns, relish trays, or diced anything is a breeze. For someone like myself who manages to cut herself on the daily, this is a great tool to cut your fresh produce every week. Having pre-chopped veggies to work with cuts meal prep down to almost nothing. Other than shredding and slicing, it has a great mixing blade. Blenders can mix well, but nothing compared to the power of a food processor. 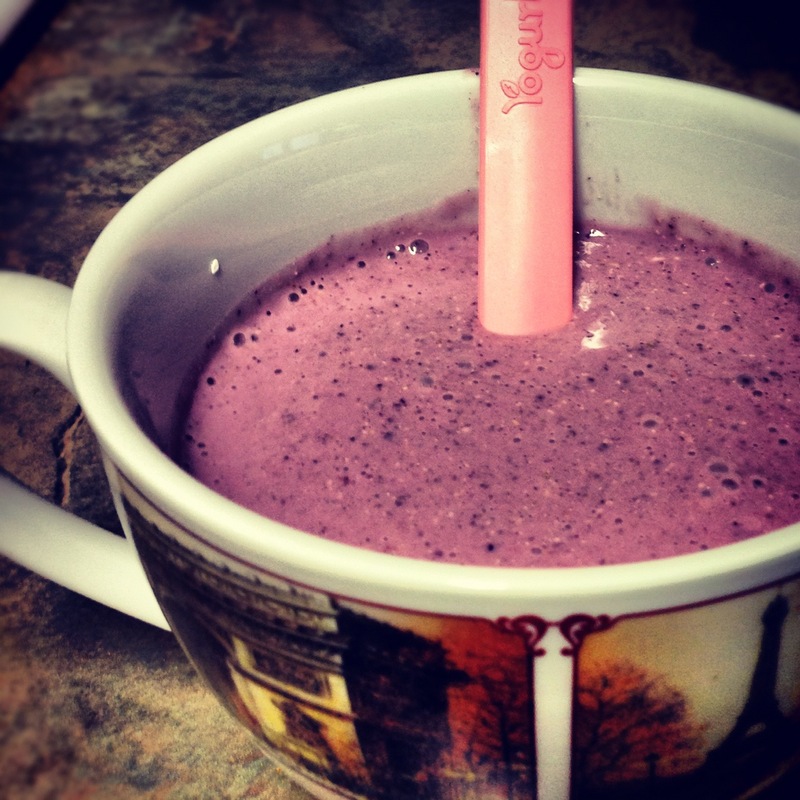 Blenders lose their magic touch when you have little liquid in what you’re trying to blend. Food processors can blend even the toughest foods together. I use mine especially for homemade hummus and my cauliflower crust pizza nights! To complete my kitchenaid trifecta, lets talk about blending. I love my blender. I love it because it’s simple, quick, and easy. 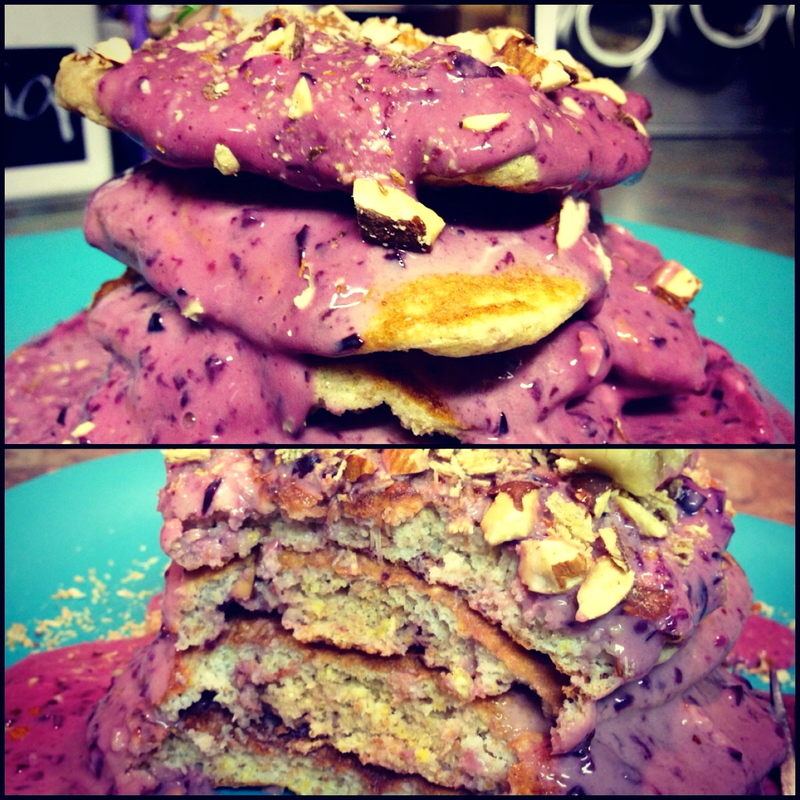 Smoothies take up it’s primary use, but I also turn to my blender when making pancake batter or other liquid recipes. Before I had a food processor, I used blenders for all of my food mixing needs. However, it often required a lot of stopping, pushing ingredients down to the blade, blending, stopping, repeat. Much less efficient, but still possible. Keep in mind what you will be using your equipment for the most when deciding what to invest in. For me, this is great to have around. Not a fan. There is very little “bang” for your “buck”. “Buck” being the fruits and vegetables and “bang” being the juice in your glass. 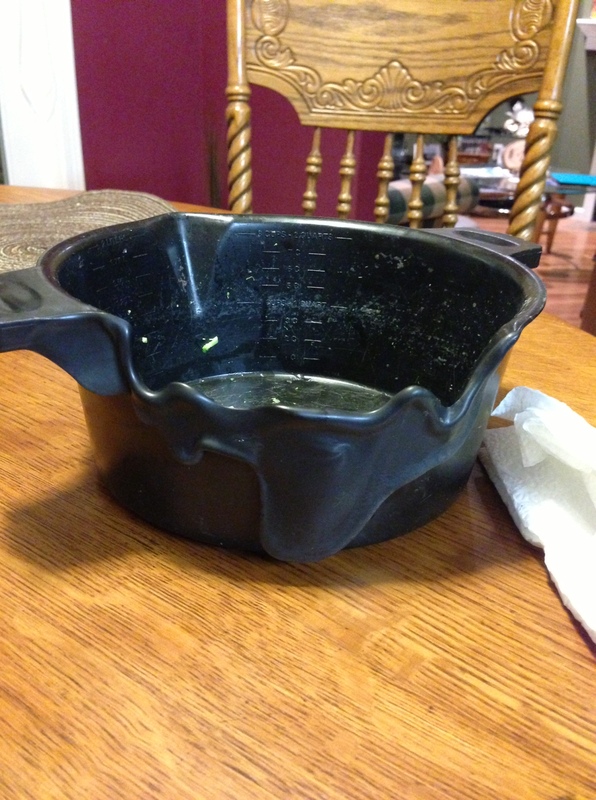 It leaves you wondering where all of your food went. I would much rather throw these things into a blender or food processor and just enjoy the “pulp”. While the end product is indeed delicious, I haven’t found the size of the machine and the much-too-troublesome cleanup to be worth the tablespoon of juice I get from what feels like my entire stock of produce. However, I will say that not all blenders can handle the thicker vegetables and fruits, making the juicer your better option. It’s just a matter of weighing what you’re trying to make and the ease at which you’re trying to do it. Oh, my, gosh. It’s like magic, it really is. For someone like myself whose weakness is frozen yogurt and ice cream…this has been a dream come true! Those of you unfamiliar with the machine – a) google it and b) let me fill you in: it’s a small device that turns frozen bananas into ice cream. The texture and consistency is identical to that of ice cream and you can add in other frozen fruit or dry items to create essentially any flavor that you want. (insert pics) Upon my first week of trying this out, I had it three days in a row…one of those times being after breakfast *turns head away in embarrassment*. Keep in mind while this is essentially very healthy – you’re basically just eating bananas. So while I love ice cream, the amount of bananas I was consuming began to sit less and less well over those three days. I think I probably went 2 full weeks without having bananas after that. No bueno. So while I fully encourage you to indulge in this purchase, proceed with caution. This is one of my best purchases post-wedding. Not everyone is into bubbly drinks. I am. Not pop, but I was buying flavored sparkling waters from the grocery store like they were going out of business. At about $1/each, I found myself spending anywhere from $10-$20 a week (Tyler started to love them, too). The sodastream is a slim machine that carbonates water in three simple presses. In addition to the carbonator itself, they sell lots of different add-in flavorings…anything from soda flavors to juice. I tend to buy flavor packets on my own (propel zero, crystal light, etc) or even just squeeze some lemon juice in – and enjoy! It’s definitely worth the up-front payment, and the only reoccuring cost is in replacing the carbonator every month or so (about $15). If you’re a pop or bubbles lover, I’d definitely be putting this on your Christmas list. All in all, while I may have a husband who never fails to gripe about our “lack of space”, I will beg to differ that a) our space is nice and tidy *thank you very much* and b) it’s all absolutely worth the space it just so happens to take up. Ladies, as long as you can keep his stomach full and happy he will stay quiet. Fastest way to a man’s heart is after all, his stomach. However, I think my quest to keep us healthy and trim has started to take a toll on Tyler. After telling him how many cool Christmas cookie recipes I found…he responded with the question, “Can we have real people cookies for Christmas?”. So, real people cookies it is. I deserve it anyways. Here’s a peek at what our Thanksgiving meal looked like…my brother came up to spend the week with us so we were cooking for a small party of three:) The meal was simple, yet delicious. Tyler took control of the turkey, using this skinnytaste recipe to brine it. It turned out delicious, as did the sweet potato pecan casserole (listed at the bottom, or on the recipage). With the green beans I just sautéed them with a little olive oil, then added almonds, garlic, and currants. The cranberry sauce was okay, but nothing worth sharing. My golden rule every year is to keep the Christmas music off as well as the tree in the closet until Thanksgiving is over. So, we went to work right away with a quick trip to Denver last weekend to stock up on “Christmasness”…including our very first Christmas tree that fits perfect in our kitchen! I’ve waited a long time to have my own tree. Finally a chance to use my large collection of ornaments. My aunt Cindi has made it a tradition to give me ornaments every year…and with the travels I’ve done as well, Tyler really had no idea what he was in for when I said I had “some ornaments” (this picture is only half of what I had laid out!). That’s all for this week. 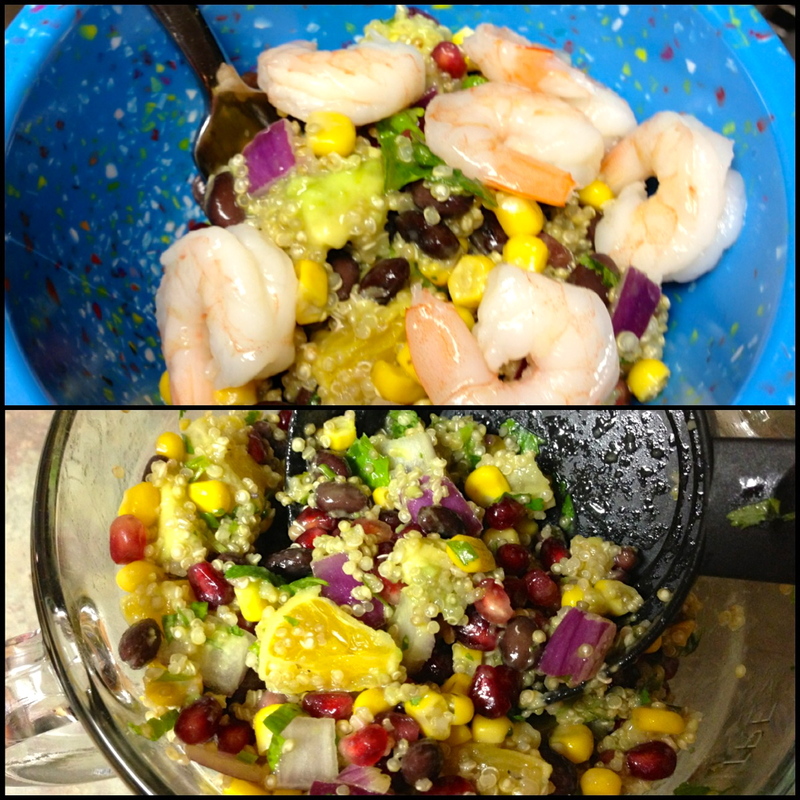 Be sure to check out my newly added recipes below, as well as my workout page and Pinterest boards! I’ll leave you with this. I used my freshly emptied almond butter jar for my overnight oats! It soaked up all the yummy goodness left in the jar. I woke up, topped it with Kashi cereal, and had a delicious breakfast to go! Give it a shot! Eating out, taking out, and driving through. So you’ve been doing great on eating healthy. You’ve worked out most days this week and want to keep the good habits rolling. Then the weekend hits. You want to go out with friends, celebrate a birthday, or maybe it’s actually the middle of the week and you just need to grab something on-the-go. You’re still new to this healthy scene and the greasy, old ways of your past have never looked bigger or better on the menu. I’m here to reassure you that you can still get delicious food outside your home, you’ll just need to approach it with a more educated mindset than you have in the past. Keep sauces and dressings on the side. Restaurants are notorious for dumping LOADS on an entree, whether it’s a salad, pasta dish, or even just chicken. You may think you’re ordering something healthy until your chicken shows up and…you can’t find it. Ask for the dressing or sauce on the side and use as little as needed -OR- replace it entirely. Instead of the ranch on the salad, ask for a lighter option, or simply oil/vinegar to sprinkle on yourself. Having pasta? Think RED. White sauces are usually full of bad fats and high calories. Ask for a bolognese or marinara sauce instead of the alfredo. Ordering meat? Again, ask for the sauce on the side or omit entirely. Most meats have plenty of flavor on their own! Avoid anything fried. Stick to options that are grilled, broiled, steamed, or baked. The preparation of your food has a tremendous impact on how good it is for you! Don’t be afraid to make substitutions. I’m probably the most annoying customer in the world, but I end up getting what I want and in my mind it’s the restaurant’s job to do that for you. Order smart side dishes. 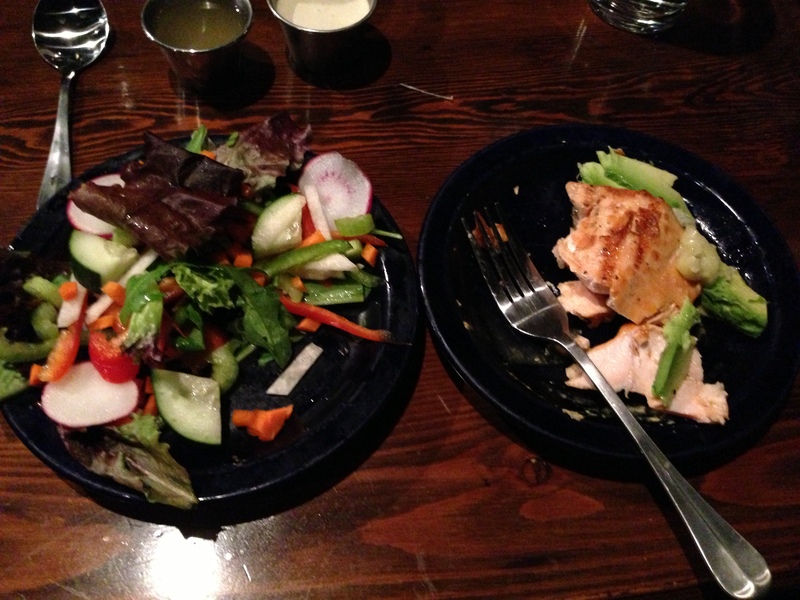 Often times the worst part of your meal lies in those 2 simple sides. I generally stay away from starches in restaurants and just ask for a double veggie side (grilled or steamed of course!) or a side salad. But if you love your carbs, get brown rice instead of white, or order a baked potato instead of fries. Avoid anything with heavy sauce (coleslaw, potato salad, etc) and if beans are an option, always opt for black. Stay away from the bread basket!! Most people take in a meals worth of calories in bread and appetizers alone! Leave your indulging for the meal and if you do have some bread, go for a multigrain or wheat option and keep it at one slice with olive oil instead of butter. If you’re at Texas Roadhouse, good luck. Ask them to go easy on the butter and oil. When preparing even veggies and meat they tend to season them in butter and cook them in lots of oil. I always ask for no butter on anything regardless of what I order, and if it’s being prepared in oil – that minimal oil be used! You may get weird looks, but you’ll be the one with a six-pack…not your waiter. When in doubt, go with seafood. As long as your seafood isn’t being fried, it’s generally hard to go wrong with a piece of fish. Keep your sides clean and you have a nutritious, satisfying meal on its way. 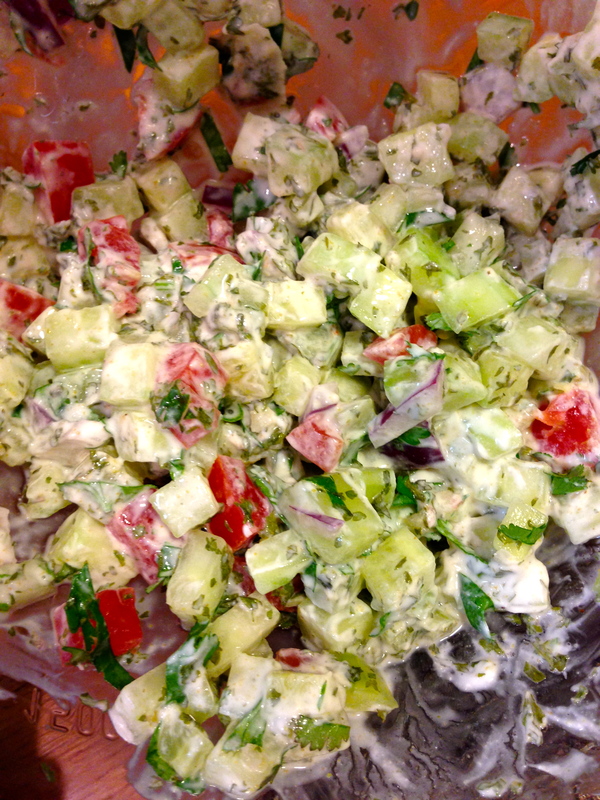 Salads – proceed with caution. I almost always go with salads when eating out, because I live in America and every food dish served in America is 3 portions too large and it’s hard to go wrong with extra portions of greens and veggies. Add a grilled chicken breast, veggie burger, or salmon on top and you have a highly nutritious, balanced meal. But rarely will a salad *as listed* on a menu be your best option. Generally I’d stay away from cheese, but if you do go with it, stick with feta, parmesan reggiano, ricotta, or another low-fat option. Ask for no croutons (unless you have the willpower to scrape them off later) and again, go for a low-fat dressing or balsamic vinegar on the side. Last check? Make sure if your salad comes with meat, that it’s grilled and not fried. Basically, just be aware of what’s coming in your salad before you put your gold star on. Dun, dun, dun…italian food. Pizza, pasta, carbs, oh my. For italian food making so many Americans fat, Italians themselves seem to be doing just fine. Biggest difference? PORTIONS. Generally, these places are notorious for being extremely generous in the sizes of their dishes. Ways to escape this trap are a) split a meal with a friend or b) take half to-go…and don’t eat it when you get home. Another way to escape the Italian restaurant trap is to go whole wheat or gluten-free. Even if it’s not listed, ask if you can replace your pasta or pizza crust with one of these options…and if you’re getting pizza, make sure to go THIN crust! Take advantage of the to-go box. Ask for a box the minute you get your food and put half of it away before you even begin. Then there’s no tempting extras lingering on your plate. Do your research. Most popular restaurants now have nutritional information available for you either at the restaurant (if you ask) or online. If you know where you’re headed beforehand, do your research and be less overwhelmed by your options on the spot. Ever heard of Eat this, not that? They’re a best-selling book series that also have an active twitter account and phone application(s). It’s a great resource for weighing options at not only restaurants and fast-food joints, but also supermarkets. They even break down food into specific food categories. Choose your restaurant wisely…if you have a say in where you’re eating, choose something with a variety of options, or someplace that won’t put you in a bad situation. Dessert a weakness for you? Probably don’t go to the Cheesecake Factory. Love pizza and beer? Maybe Old Chicago isn’t the place. Like I’ve said before, seafood places are a great option, as well as Mongolian grills or somewhere with a yummy salad buffet (Ruby Tuesdays anyone?). If worse comes to worse, enjoy a cheat meal. You deserve it. Make your Saturday a fatterday and just be sure you stay on track the rest of the week. Another option? Walk home. Okay kidding. But in all honesty I once ran home from 4 Queens (ice cream shop) because I felt so disgusting afterwards. HAHA, ohhhh please tell me someone reading this remembers this moment… [Caitlin, Blaire, Abby, Sara, Jacqui?] It only took me 10 years to figure out I can just eat better, and less, and not have to do extra sit-ups to feel better afterwards (Cara, Jacqui – you can attest). *Confession 2: Jacqui and I once did post-meal sit-ups, and I actually brought food over and ate while we did them* WHO WAS I? 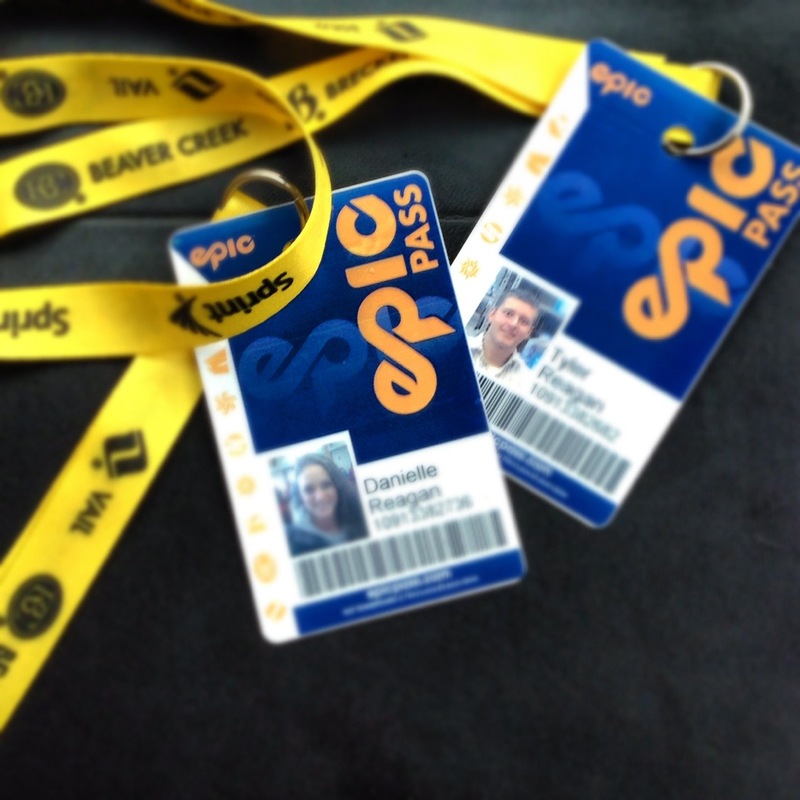 We finally have our EPIC ski passes! We got a significant discount on these for having our wedding in the mountains this summer, woo! “Lets get married every summer” – Tyler. 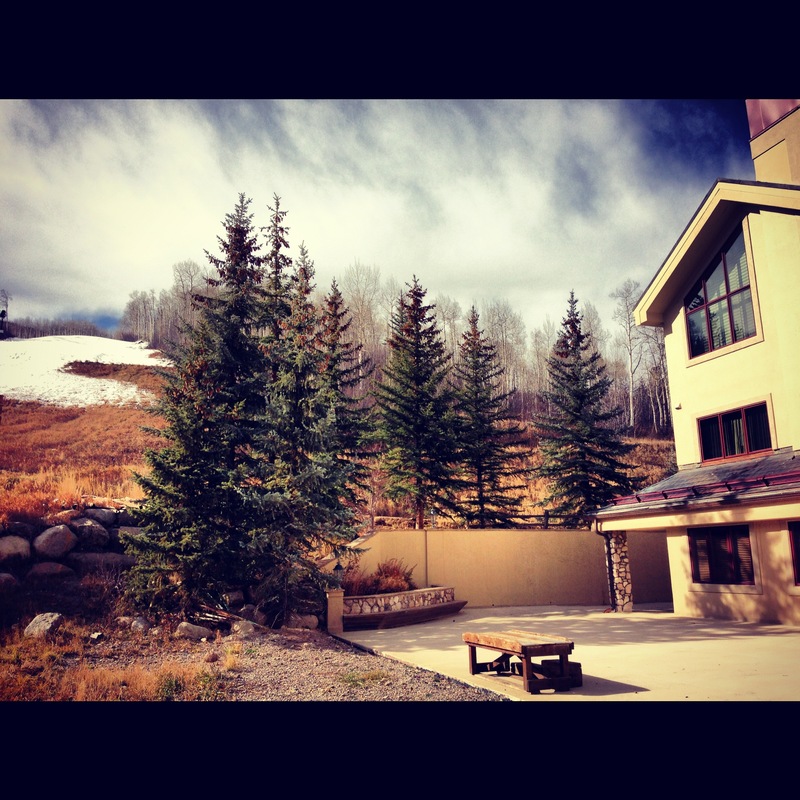 Ha, if only it worked that way:) We now have unlimited access to all Vail Resorts mountains in Colorado…now all we need is snow. Next exciting news this week…pomegranates are in season!!! Of course we grabbed a few and have had some on-hand to throw in anything and everything we eat. Side note: if Tyler had one wish in this world it would be to swim in a pool of pomegranate seeds and frolick in a field of pomegranate bushes. This grown adult would make special trips to frozen yogurt joints only for the pomegranate seeds…not to worry, I more than made up for his slacking in a true bowl of frozen yogurt. 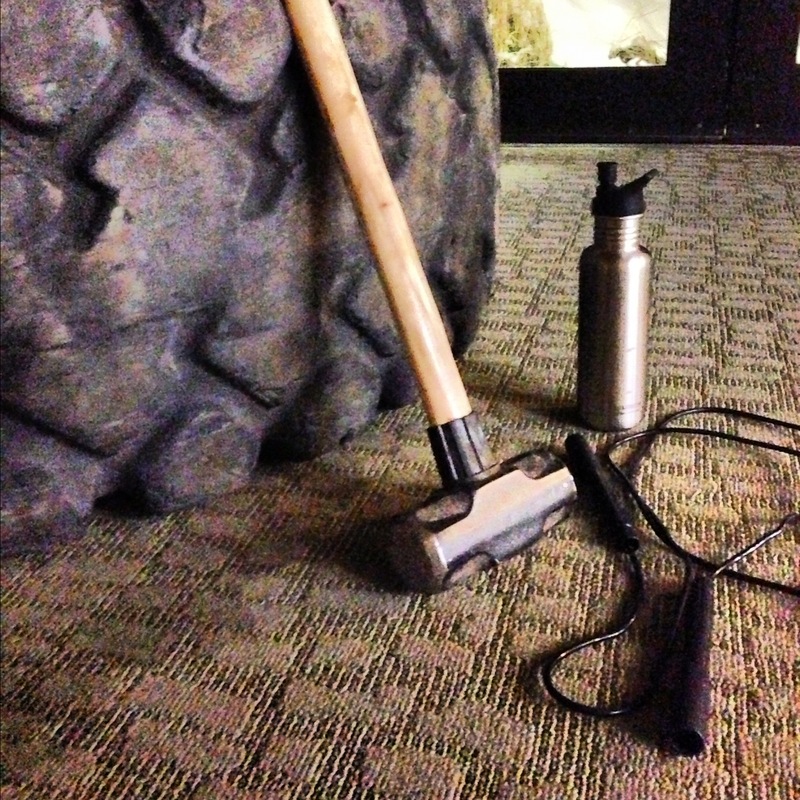 Got to use some fun new equipment for this sweat-buster…and got my buck kicked during this brutal circuit. Hope everyone has an awesome Thanksgiving week!! 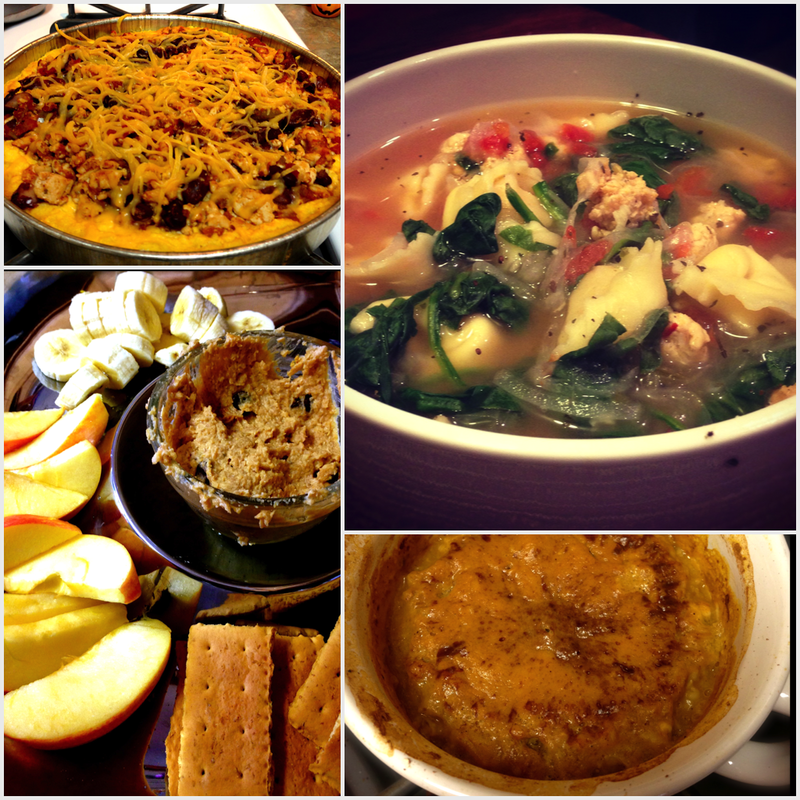 I know I can’t wait to try out some new recipes…and even better – see what everyone else is making! 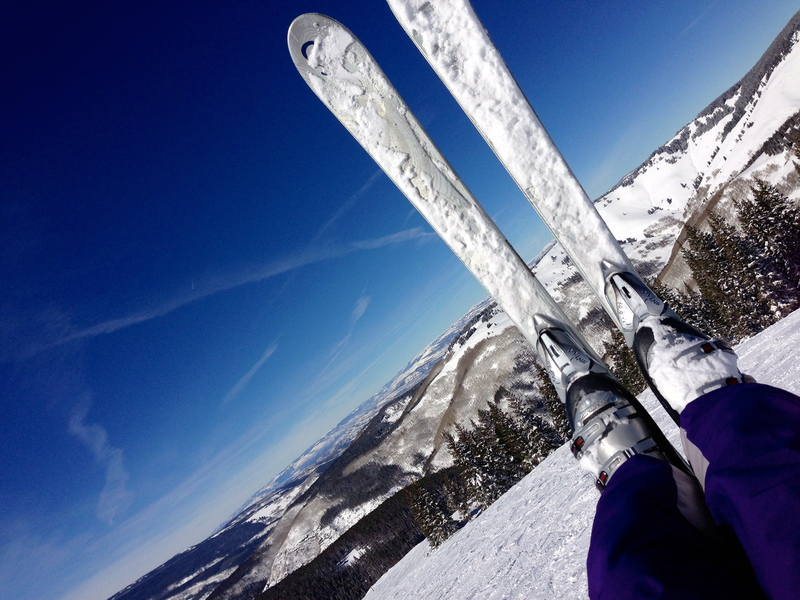 I have to work this week as it’s OPENING day in Beaver Creek on Wednesday, but Tyler and my brother will get to scope out the skiing while I take care of the injured…and they also will figure out how to cook a Turkey. I’ve seemed to escape this task the last few years and I’m not complaining. So, happy cooking and eating this week! May you enjoy the best nap of the year approximately one hour after your Thanksgiving meal.